一种用于在例如移动互联网的联网客户机-服务器环境下在没有明确提供的装置或用户识别信息的情况下唯一地识别装置的技术，其中，内容被从服务器下载到在客户机装置上执行的装置浏览器并且以对位于装置浏览器的用户透明的方式使用嵌入在内容中的静态XML标记标签的技术来推导全球唯一装置标识符。 For example networking client mobile Internet - in the case of technique provides no clear means or the user identification information uniquely identifying the device server environment, wherein the content is downloaded from the server to execute on the client device browser means and a manner transparent to the user apparatus is located using a browser embedded in the content art static XML markup tags to derive globally unique device identifier. 捕获装置识别信息，并在与全球唯一装置标识符相关联的装置概要数据库中维护该装置识别信息。 Capturing device identification information, device identification information and maintain a database on the device profile globally unique device identifier associated. 具体地，嵌入到推荐链接内容页面中的标记代码有效地从发布服务器下载软件，并且然后在客户机装置浏览器中对软件进行实例化。 Specifically, embedded links to content on the page markup code effectively download software from the server release, and the software then instantiated in a client device browser. 所述软件透明地且动态地插入对装置识别管理系统的互联网地址请求。 The software and the Internet address dynamically inserting device identification management system request transparently. 相关申请的夺叉引用:本申请要求2008年8月26日递夺、标题为“MOBILE COOKIEARCHITECTURE (移动“小甜饼”架构)”的美国临时申请N0.61/091，816的权益。 Wins fork  Reference to Related Applications: This application claims the August 26, 2008 handed wins, entitled "MOBILE COOKIEARCHITECTURE (mobile" cookies "architecture)," the US provisional application N0.61 / 091,816 of . 本发明涉及一种用于在例如移动互联网的联网客户机-服务器环境下实现在没有明确为识别客户机装置的目的而提供的装置或用户识别信息的情况下唯一地识别网络分布式装置的匿名的且对用户透明的技术的系统，具体地，涉及设备和附随方法。  The present invention relates to a method for, for example, mobile Internet networking client - achieved uniquely identify the network without explicit identification for the purpose of providing the client device or the user of the apparatus identification information distributed server environment anonymous and the system transparent to the user device technology, particularly, relates to apparatus and accompanying methods. 尤其是随着移动网站的数量增加和使用移动装置的用户持续快速扩张，互联网使用，特别是移动互联网的使用爆发性地增长。  and especially with the increase in the number of mobile websites using the user's mobile device's sustained and rapid expansion of Internet use, especially the use of mobile Internet explosive growth. 移动互联网装置的特征在于它们的受约束的软件环境以及每个装置本身的独特性。  In the mobile Internet device is unique in that they are bound and software environment of each device itself. 约束包括导致内容检索缓慢的最小网络带宽、最小的CPU处理和存储装备以及缺乏跨会话的永久存储，跨会话的永久存储被称为客户机端浏览器“小甜饼(cookie) ”。 Constraints include the minimum lead content retrieval slow network bandwidth and minimal CPU processing and storage equipment and the lack of cross-session of permanent storage, permanent storage across sessions is called client-side browser 'cookies (cookie) ". 现今，传统的在线广告方法(例如跟踪跨会话的个人用户和控制呈现给他们的广告的频率和相关性)在移动互联网中完全不存在。 Today, traditional online advertising methods (such as tracking individual users across sessions and presented to control the frequency and relevance of their ads) completely absent in the mobile Internet. 使用Web上的浏览器小甜饼推导的关于移动活动的标准广告度量(例如独一网站访客的数量)的缺乏阻扰了在线广告商利用移动装置的独特个性化性质和本地内容。 Use standard ad metrics (such as the number of unique visitors to your site) about the mobile activities on the Web browser cookies deduced lack of obstruction of the unique personalized nature of online advertisers and local content using mobile devices. 移动使用形态，通常是受约束的网络环境以及本身的装置限制性的结果，严重地妨碍了实现Web在线用户所期待的和广告商所期待的高质量的广告体验。  mobile use form, usually constrained network environments as well as the results themselves restrictive device, a serious impediment to the realization of Web users expect online and advertisers are looking for high quality advertising experience. 例如，使用书签进入规律访问的网站是普遍的，这大部分是受键入完整的互联网网站地址的痛苦所驱使。 For example, using a bookmark into the law of access to the site is common, it is most painful type the full Internet address of the site by the driven. 极小的移动键盘和基于用户不友好形式的界面的结果是，非常少的用户将直接输入内容网站地址。 The results tiny mobile keyboard and forms-based user interface is unfriendly and very little user input content site address directly. 相反，他们发现使用转运平台(on carrier deck)搜索引擎来定位相关内容容易得多，然后保存用于无线应用协议(WAP)平台或他们规律访问的互联网网页的书签，这个保存的书签用于未来直接进入。 Instead, they found that the use of transport platform (on carrier deck) search engine to locate relevant content much easier, and save bookmarks for Internet pages of the Wireless Application Protocol (WAP) platform or the law of their visit, the saved bookmarks for future enter directly. 移动互联网广告目前包括将图形文件实时地流传输到用户的移动装置浏览器所展现的内容中。  Mobile Internet advertising now includes the graphics file streaming content to the user's mobile device browser to show in real time. 在发行者的内容管理系统将图像和文本行为召唤(call to action)广告标签嵌入在内容中。 In the publisher's content management system images and text behaviors call (call to action) ad tag embedded in the content. 这发生在通过无线网络将实际内容传递给用户之前。 This occurs before the actual content over the wireless network to the user. 目前移动的许多服务器端包含(server side include)广告服务系统的常规做法是记录当通过互联网将广告标签从广告服务器发送到发行者的内容系统时的用户展示次数(impression)的传递，而不管它们是否实际到达。 Conventional current practice of many server-side movement contains (server side include) advertising system is recorded when the ad tag sent from the ad server to deliver user impressions (impression) when the issuer of the contents of the system via the Internet, regardless of their whether actual arrival. 并且，服务器将获得文件的最后修改日期且在HTML文件被发送给请求者之前插入该最后修改日期。  Further, the server and obtain the last modification date of the file and the last modified date is inserted in the HTML file before being sent to the requester. 包括服务器端包含声明(例如以上“echo”声明)的Web文件通常被管理员定义为具有后缀的文件。 Web files  statement includes a server-side include (e.g. above "echo" statement) is typically defined by the administrator as a file with suffix. 这样，可认为服务器端包含是公共网关接口(CGI)应用程序的有限形式。 Thus, the server may be considered to comprise a limited form of Common Gateway Interface (CGI) application. 事实上，CGI并不被使用。 In fact, CGI is not being used. 服务器仅在服务器端包含文件里搜索CGI环境变量，并将变量信息插入在该文件中“包含”声明已经被插入的地方。 File search server that contains only CGI environment variables on the server side, and variable information is inserted in the document has been inserted in place of the statement "contains." 当通过互联网接收到广告标记标签时，发行者的内容管理系统就将它们插入到内容中。  When receiving the advertisement tag label through the Internet, the content issuer management system will be inserted into the content thereof. 这发生在将内容发送到终端用户装置之前。 This occurs prior to the end-user device transmits the content. 更可取的方法是仅在将广告实际呈现给终端用户之后对展示次数进行计数。 Preferably the method only counting impressions after the advertisement actually presented to the end user. 由于大多数移动广告系统没有办法确定实际被传递和播放的广告是否结束，所以结果可能是不精确的展示次数结算。 Since most mobile advertising system has no way to determine the actual ad is delivered and whether the end of the play, so the results may be inaccurate impressions settlement. 所述问题的另一个示例是在整个广告被展现之前导航到新的内容页面的用户，这导致展示次数被错误地报告，尽管那些用户从没见过该广告。 Another example is the issue before the entire advertisement is presented to the user to navigate the new content of the page, which causes impressions to be incorrectly reported, although those who have never seen the ad. 大多数发行者完全不能负担附加服务器的数量和它们需要管理多个广告服务器卖主的多种风格的广告嵌入软件的复杂性。  Most issuers can not afford the full number of additional servers and ad servers they need to manage multiple vendors of various styles of advertising embedded software complexity. 为了与多个服务器端包含系统相互配合工作，仅以获得使它们的内容完全套现的(monetize)足够的目录填充率(inventory fillrate)，这是需要的。 To the system comprising a plurality of server cooperate with each other, so that their content is obtained only complete cash (Monetize) filling rate sufficient directory (inventory fillrate), which is required. 下述增加的要求在成千上万个同时进行的用户之间完全不可扩展(scalable)，所述增加的要求即为，为了在发行者可插入广告标签、然后将内容发送给用户之前在互联网上检索这些广告标签，发行者支付他们自己的带宽，以与服务器端包含系统相互配合工作。 The following additional requirements among thousands of simultaneous users is completely non-extended (Scalable), that is the increasing demand, to be inserted in the ad tag issuer, then the contents before sending to the user the Internet these ads on the search of labels, publishers pay for their own bandwidth, and server systems to include the pieces fit together. 正如WEB广告一样，客户端传递和计数机制对于在多方之间精确地分布收益以及提供遵循传统广告中的标准的精确审计是必需的。 As WEB advertising, client delivery and accurate counting mechanism for the distribution of income between the parties and provide follow traditional advertising in the precise standard audit is required. 鉴于与服务器端包含移动广告系统相关联的基本缺点和本领域已知的可靠浏览器“小甜饼”实现的缺乏，自动匿名服务器端装置识别和装置概要管理出现，以保持所有这些技术的大部分前途。  Given the fundamental shortcomings known in the art and reliable browser "cookies" associated with the mobile advertisement system comprises a server implemented lack automatic anonymous server device identification profile management means and appeared to keep all of these most promising technology. 但是， 移动广告服务的常规实现中的固有限制有效地防止这种形式的广告有效地实现其意图。 However, the conventional mobile advertising services to realize the inherent limitations effectively prevent this form of advertising to effectively achieve its intent. 而且，所有已知的移动广告技术中的固有缺陷总地在很大程度上共同禁止了移动广告的使用。 Moreover, all known mobile advertising technology inherent defects generally largely common prohibit the use of mobile advertising. 存在对于用于在不需要明确地提供的装置或用户识别信息的情况下匿名地、透明地、唯一地识别网络分布式装置的新系统的迫切需求，该新系统没有与本领域已知的这样的技术相关联的弱点。  there is a urgent need for a new system in the case where the user or device identification information need not explicitly provided anonymously, transparent, uniquely identifying network-distributed devices, the new system is not already in the art such a technique known vulnerabilities associated. 因此，需要创建新的匿名的独一装置识别系统，该系统可被广告商用于对移动互联网装置扩展移动广告的使用。 Therefore, we need to create a new anonymous unique device identification system that can be used by advertisers for mobile Internet devices expand the use of mobile advertising. 本发明涉及这样一种系统和方法，该系统和方法用于实现在没有明确地为识别客户机装置的目的而提供的装置或用户识别信息的情况下，唯一地识别网络分布式装置的匿名的且对用户透明的技术。  The present invention relates to a system and method for implementing the system and method without explicitly for the purpose of identifying the client device or a user provided device identification information uniquely identifying network-distributed devices anonymous and transparent technical users. 以这种方式，本发明的系统消除缺点，并克服与移动服务器端包含广告技术和下述移动装置相关联的缺点，所述移动装置不实现传统的在线浏览器“小甜饼”，或者允许禁用传统的在线浏览器“小甜饼”(即，明确地为识别客户机装置的目的而提供的装置或用户识别信息)。 In this manner, the system according to the present invention is to eliminate the drawbacks and overcome the disadvantages advertising techniques and the following mobile devices associated with the mobile server included in the mobile device does not implement the traditional online browser "cookies", or allow disable traditional online browser "cookies" (ie, device or user identification information to clearly identify the purpose of the client devices provided). 另外，在将用户指引到发行者网站之前过滤掉移动装置“小甜饼”的载体网关将不会负面地影响广告商的管理移动广告活动的能力以及他们的报告独一用户和对向特定用户呈现特定广告的次数进行频率限定的能力。 In addition, the mobile device filters out "cookies" carrier gateway will not adversely affect the ability of advertisers to manage mobile campaigns and their reports only on the specific user and user before the user to the publisher website the number of times a particular ad showing the ability to limit the frequency. 用于匿名地识别访客的独特解决方案的要点的策略是排除(elimination)而不是选择。  points for anonymous visitors identify unique solutions strategy is to exclude (elimination) rather than choice. 访客通过合伙发行者网站进入根据本发明实现的广告网络，并且当搜索与当前用户(本系统正从先前识别的客户机装置的数据库向其传递广告)匹配的最佳客户机装置概要时，所提出的独一装置识别管理系统匿名地使用排除，而不是选择。 Site visitors enter through partnerships issuer Network according to the present invention is implemented, and when the current user search summary (the present system is a database from a client device to pass to previously identified ad) best matches the client device, the unique device identification management system proposed negative anonymously, select instead. 本质不进行选择，而是通过转变，所有答案都是可能的，根据当前环境下的“最适者生存”排除不是那么可行的解决方案，最适者作为合适的最佳解决方案冒泡。 Nature is not selected, but through transformation, all the answers are possible, according to the "survival of the fittest" in the current environment is not ruled out that a viable solution, as appropriate fittest best solution bubbling. 也就是说，根据本发明的方法是搜索以前为其服务过广告的访客装置的匹配概要(profiles)，并相应地对这些访客服务广告。 That is, according to the method of the present invention is to search for previously served matching profiles (Profiles) ad the guest apparatus and corresponding service advertisement to those visitors. 根据本发明能有效率地、唯一地识别访问发行者网络的用户的关键是使用排除概要的鉴别符(discriminator)的加权分级结构,直到识别出最佳的可能的匹配为止。  According to the present invention can efficiently, to uniquely identify the user to access the issuer key is to use the network to exclude outline discriminator (discriminator) weighted hierarchy until identify the best possible match. 加权分级结构使得当处理足够的数据以将某人识别为以前的访客时可立即终止搜索。 Weighting hierarchical structure such that when processing data sufficient to identify the person to a previous visitor can immediately terminate the search. 这个人被限定为其装置概要已在本系统的数据库中创建的某人。 This person is limited to a person has created in the database of the system in its device profile. 如果访客不匹配任何存在的数据库装置概要，则将该访客作为新的独一用户添加。 If the guest does not match any existing database outline device, the visitors only as a new user is added. 关于访客的信息通过以下方式获取，即，从被透明地插入到访客的移动装置的移动装置浏览器中的软件脚本获得各种客户端装置属性。 Obtaining information about guest in the following manner, i.e., to obtain various properties from the client device is transparently inserted into the mobile device browser software script mobile device in the visitor. 构成“首尾相连”设置的鉴别标准的加权属性实现其所有者所特有的匿名装置签名。 Constituting the "end to end" attribute discrimination standard weighting means arranged to achieve anonymous signature specific to their owners. 鉴别符被来自客户机装置中执行的、对WAP和互联网广告和装置检测和内容译码服务器的装置请求收集。 Discriminator means from the client is executed, a request for the WAP and the Internet to collect advertising content and decoding means detects and servers. 另外，脚本能读取和传达装置环境的内部属性，这些内部属性一起最终构成存储在本系统的装置概要数据库中的数字签名。 Further, the script can be read and means communicating the interior environment attributes, these attributes together with the final configuration inside the digital signature stored in the device profile database of the present system. 关于鉴别符的分级结构(根据每个鉴别符在用户概要之间进行区分的能力对每个鉴别符进行加权)，如果客户机装置支持“小甜饼”，则本系统使用浏览器“小甜饼”作为第一个最高加权参数。  For the discriminator hierarchy (the ability to distinguish between user profiles based on each authenticator discriminator weights each), if the client device supports the "cookies", then the present system browser "cookies" as the first highest weighted parameters. 如果根据本发明在过去在用户的客户机装置中已使用该用户的全球唯一标识符(GUID)设置了“小甜饼”，则已知他或她以前已访问过，并且本系统已经使用与本系统的数据库中的该装置概要相关联的唯一标识符给它们加标签。 If the "cookie" According to the invention has in the past using the user's globally unique identifier (GUID) in the user's client device, it is known that he or she has previously visited, and this system has been used with the unique identifier associated with the device profile database of the present system to tag them. 关于每个属性及其值的三元组存储在微软的内置的.NET匿名概要分析系统内。 Triple stores for each attribute and the value of the built-in Microsoft .NET Anonymous Profiling in the analysis system. 所有鉴别属性包括客户机装置是否接受“小甜饼”，并且是这样，则将这些鉴别属性作为可搜索记录存储在装置概要数据库中。 All client device identification attributes include whether to accept "cookies," and so, it will identify these properties as searchable records are stored in the device profile database. 如果用户进入根据本发明操作的网络并且他们的客户机装置不支持客户机端浏览器“小甜饼”，则该属性(即，客户机装置不支持“小甜饼”的事实)仍使得可通过在为该特定客户机装置而创建的概要中被设置为空的这样的信息来鉴别用户，并被用于从进一步的搜索排除包含实际小甜饼的概要。  If a user enters a network in accordance with operation of the present invention and their client device does not support the client-side browser "cookies", the attribute (i.e., the fact that the client device does not support the "cookies" in) such that the outline can still created for the particular client device is arranged to empty such information to identify the user, and is used to exclude from the search further comprises the actual outline of cookies. 本系统继续对剩余的概要总体进行折半处理(halfsplit)，需要进一步搜索每个另外的鉴别装置属性，所述另外的鉴别装置属性每个给出模式匹配所需的越来越小的概要总体。 The present system continues for the remaining binary outline of the overall process (halfsplit), each further need further searching the attribute discriminating means, the discriminating means further given pattern matching attribute for each smaller overall schematic required. 如果一旦所有属性都被搜索、但是没有获得匹配，则将新的概要添加到数据库中，所述新的概要包含该当前用户的移动装置的独特设置和无线环境属性，比如载体或者他们订阅的无线网络的移动虚拟网络运营商(MVNO)。 If Once all attributes have been searched, but they do not match, then the new profile added to the database, the new profile comprises a unique set of the current user of the mobile wireless device and environmental attributes, such as a wireless carrier, or they subscribe network mobile virtual network operator (MVNO). 定义个人用户概要的逻辑数据结构被最佳地认为是非常长的二进制数字签名。  individual user profile defines a logical data structure is considered to be very long optimally binary digital signature. 这些二进制字符串由连接属性构成，这些连接属性是从在终端用户装置中执行的软件对各种外部匿名独一装置识别管理服务器的请求捕获到的。 These binary string composed of connection properties, the connection properties from the software executing various external end user device requesting an anonymous unique device identification management server captured. 指定内部装置环境的附加属性也被捕获，以提供构成完整的用户装置签名的附加比特字符串。 Additional property specifies the environment inside the apparatus also captured, a string of bits to provide additional user signature means complete configuration. 在广告请求中透明地插入软件脚本，所述广告请求被嵌入在然后基于时间片(time sliced)在装置内部或外部执行的发行者内容中。 Transparently inserting software script ad request, the ad request is then embedded in a time slice basis (time sliced) in a content issuer means internal or external executed. 传递的软件脚本在非常有限的时间段内在内容页面中执行。 Software implementation scripts delivered in the content page in a very limited period of time. 当时间片结束时，脚本被对本发明的匿名独一装置识别管理系统的实际装置识别服务请求代替，并表现为对用户完全透明。 When the time slice, the script is replaced by the actual device identification request service anonymous unique identification apparatus according to the present invention, a management system, and appears as completely transparent to the user. 用于用户访问的书籍标记网站的移动装置工具以及下述事实使得可将加标签的书签用作移动浏览器历史列表“小甜饼”，所述事实即，与Web浏览器不同，所显示的当前内容的URL通常在用户屏幕上不可见。  The book mark for user access site and the fact that the mobile device such that the tool can be tagged as a bookmark list of the mobile browser history "cookies", i.e. the fact, and Web browsers, the current URL displayed content is usually not visible on the user's screen. 这些普遍存在的书签是跨互联网会话反复出现的几种对象之一，尽管通常不被认为是用于在没有传统浏览器“小甜饼”的装置上实现永久存储的机制。 These bookmarks are one of several common objects across the Internet session recurring, although generally not considered to be a mechanism for permanent storage implemented on a "cookie" in the browser without the traditional device. 用于互联网网站的用户进入点(entry point)的互联网协议重定向机制的使用提供使用浏览器历史列表中的装置识别信息唯一地给这些书签地址加标签的机会。 Using the Internet protocol redirects  Internet sites for user entry point (entry point) to provide device identification information using the browser's history list uniquely opportunity to address these bookmarks tagged. 重定向机制普遍被理解为允许将用户从所选择的内容页面转移到不同的内容页面。 Redirection mechanism is commonly understood to allow users to transfer pages from the selected content to different content pages. 结果是将与他们的跨互联网会话持续存在的载体帐号相关联的独一用户ID存储在移动装置浏览器书签永久储存器内。 The result is within the mobile device browser bookmarks permanent storage will be with them across the Internet session persistence unique user ID stored carrier account is associated. 每次他们进入书签，该信息就易于被本发明的独一装置识别管理系统捕获，所述书签可与本系统的装置概要数据库内的特定合伙网站相关联。 Every time they enter the bookmark, the information is readily capture the unique device identification management system of the present invention, it may be associated with a specific partner sites within the device profile database of the present system the bookmark. 本系统使用语义网RDF数据存储、构成用户签名的加权分级结构中的每个属性的三元组。  The system using semantic web RDF data storage, constituting the weighted hierarchy in the user signature triples for each attribute. 这些属性每个提供在用户的装置匿名概要中维护的可搜索属性。 These properties provide maintenance for each user in the Anonymous Profile apparatus searchable attributes. 这种方法的好的类比是20个问题的儿童游戏，这是因为可仅通过作为搜索技术的排除与装置不相关联的属性来快速猜出未知的对象。 Good analogy of this approach is that children's play 20 questions, because can quickly guess the unknown object through the property is not only associated with a search technology and excluded devices. RDF格式的用户概要的搜索非常有助于具有内置的推理处理的软件。  RDF format of the user's search is very helpful overview of the software has built-in reasoning process. 通过根据签名标准如何鉴别来对这些签名标准进行加权，本系统能执行推理，并能在最早机会终止搜索匹配的RDF概要，从而确保有效率地对存在的概要进行可扩展识别。 Through how to identify these signatures to be weighted according to the standard signature standard, the system can perform reasoning, and can terminate the search for matching RDF summary at the earliest opportunity, in order to ensure the efficient conduct of the existing outline scalable identified. 非常有效率的整合实现通过将微软的.NET匿名概要分析能力与所提出的匿名独一装置识别管理系统结合来实现。  very efficient integration achieved by Microsoft's .NET Anonymous Profiling capability combined with anonymous unique device identification management system proposed to achieve. 由于本系统从受众分析进行学习，所以这种混合实现策略使得可用附加的鉴别参数来增强存在的用户概要，以使用附加的推理规则唯一地识别移动客户机装置。 As the system learns from its analysis of the audience, so that this hybrid strategy can be used to achieve additional parameters to enhance the identification of the user profile exists, to use additional inference rule uniquely identifying the mobile client device. 这两种系统的概要可被扩展，而不影响存在的概要数据结构，从而提供向后兼容性。 Summary of both systems can be expanded, without affecting the existing summary data structure, thereby providing backward compatibility. 为了将新的属性添加到存在的.NET匿名概要数据库，仅在.NET应用程序的“web.config” 文件中指定新属性的默认值，即，〈add name = “FavoriteColor” defaultValue =“Red”/〉。 In order to add new properties to existing .NET Anonymous Profile database, only specify the default value for the new property in the "web.config" .NET application's files, that is, <add name = "FavoriteColor" defaultValue = "Red" />. 具有该默认配置的新属性被自动添加到所有存在的概要中。 The default configuration having a new attribute is automatically added to all existing profiles. 本发明可与任何数量的当前的和未来的在线广告和/或用户行为引擎整合。  The present invention can be integrated with any number of current and future online advertising and / or user behavior engine. 它提供跨移动浏览会话的持续移动装置识别，该识别通常由传统的客户机互联网万维网浏览器应用程序执行，所述浏览器应用程序称为浏览器“小甜饼”。 It provides a continuous movement of a mobile device across browsing session identification, the identification is typically performed by a conventional client Internet web browser application, the browser application called browser "cookies." 在移动环境下，大部分客户机装置目前缺乏客户机端浏览器“小甜饼”工具，或者允许它们被用户或者它们的互联网网关处的载体禁用。 In the mobile environment, most of the client device currently lacks the client side browser "cookies" tool, or allow them to be disabled user or their carrier at the Internet gateway. 为了积累、存储过去的上下文消费(context consumption)和将过去的上下文消费与特定的永久标识符相关联，根据本发明的装置概要可提供随时间对特定用户的移动内容消费进行监控所需的这种识别机制。 In order to accumulate, store past consumption context (context consumption) and consumption of the past context with a specific permanent identifier associated with the device profile in accordance with the present invention may provide a mobile content consumption over time for a particular user is required to monitor it species identification mechanism. 这些标识符然后可被用于与特定用户和他们过去的行为或者预测的未来行为相关地确定未来营销通讯消息的目标。 These identifiers can then be used for future behavior with specific users and their past behavior to predict or determine the objectives of the future of marketing communication messages related to. 通过结合附图考虑以下详细描述，可易于理解本发明的教导。  By considering the following detailed description in conjunction with the accompanying drawings, can be readily understood that the teachings of the present invention. 图1A描绘图1B和图1C的图纸的正确对准。  Figure 1A depicts the correct alignment of FIGS. 1B and 1C of the drawings. 图1B和图1C共同描绘通过互联网实现的示例性客户机-服务器分布式处理环境的高级框图，该图连同与本发明相关的客户机装置和本系统的组件之间的、在所述环境下发生的基本计算机间动作和相关联的客户机处理操作(使用从图1B延伸到图1C的阶梯)一起体现了本发明的教导。  FIGS. 1B and 1C together, depict an exemplary client through the Internet for - server-level block diagram of a distributed processing environment, together with the drawing related to the invention between the client devices and components of the system, in the inter occur under basic computer operation environment and said associated client process operation (FIGS. 1B to 1C extends from ladder) embodies teachings of the present invention together. [0031 ] 图2描绘图2A和图2B的图纸的正确对准。  FIGS. 2A and FIG. 2 depicts the correct alignment of the drawing of FIG. 2B. 图2A和图2B共同描绘一般的网页HTML代码35和本发明为了确定装置概要和从装置识别管理系统检索全球唯一装置标识符GUID而对该代码动态进行的改变，代码35具体包括透明地调用本发明的脚本请求或者独一装置识别标签40，所述改变具体地是，插入动态产生的对于标签40的独一装置识别请求210，以得到页面35'。  FIGS. 2A and 2B together depict a general HTML code pages 35 and variations of the present invention and retrieval means for determining a schematic globally unique identifier GUID from the device management system, device identification code is carried out the dynamic code 35 comprises a transparent script call request or the present invention means a unique identification tag 40, specifically the change, insert dynamically generated for unique device identification request tags 40 210, pages 35 to obtain a '. 图3描绘图1B和图1C中显示的客户机装置5的高级框图。  FIG 3 depicts a client device of FIG. 1B and 1C shown in FIG. 5 is a block diagram advanced. 图4描绘驻存(resident)在图1B中显示的服务器装置20内的独一装置信息管理系统400的简化高级框图。  Figure 4 depicts a resident (Resident) server apparatus shown in FIG. 1B simplified high level block diagram unique within the device information management system 20 is 400. 图5描绘图5A和图5B的图纸的正确对准。  FIG. 5 depicts the correct alignment of the drawing in FIG. 5A and FIG. 5B. 图5A和图5B共同描绘独一装置概要管理系统的高级框图和代表性的.NET应用程序“web.config”文件，该文件定义装置概要数据。  FIGS. 5A and 5B, together, depict the unique device profile management system and a high level block diagram representation of .NET application "web.config" file that defines the device profile data. 图7描绘图4的块420中显示的独一装置识别请求流程图700的流程图。 The flowchart 700 of  FIG. 7 depicts a block 420 of Figure 4 shown in a unique device identification request. 在考虑以下描述之后，本领域技术人员将认识到可在不可获得明确提供的装置或用户识别信息的任何联网客户机-服务器环境下利用本发明的教导。  After considering the following description, those skilled in the art will recognize that the device is not available, or the user explicitly provided identification information of any networking client - the teachings of the present invention using the server environment. 这样的环境可包括互联网或内联网或者在其下移动装置浏览器被用于通过网络通讯信道从服务器访问和下载文件的任何客户机-服务器环境，例如移动互联网。 Such an environment may include the Internet or within an intranet or at which the mobile device browser is used to access from any client server and download files through the network communication channels - such as a mobile Internet server environment. 在这方面，所提出的独一装置识别管理系统的服务器可以是在网络中的任何计算机上执行的分离的应用程序。 The server the unique device identification management system in this regard may be any of the proposed separate application executing on a computer in the network. 为了简化和帮助理解的目的，在不需要明确提供的装置或者用户识别信息的情况下唯一地识别网络分布式装置中所用的示例性背景下公开本发明。  For simplification of understanding and help, in the case where the present invention is disclosed apparatus need not explicitly provided, or the user identification information uniquely identifying the background example a distributed network apparatus used. 在考虑获得本说明书之后，本领域任何技术人员将易于意识到可如何将本发明的教导容易地并入到任何客户机-服务器或者其他类似的分布式处理环境中，在所述类似的分布式处理环境下，客户机不仅可包括连接至网络的特定计算机，而且还包括这样的软件过程，该软件过程具有与另一个这样的过程的网络连接，并向后者请求信息，并且作为响应获得由后者提供的信息。 After consideration of the present specification is obtained, anyone skilled in the art will readily appreciate how the teachings of the present invention can be readily incorporated into any client - server, or other similar distributed processing environment, like in the distributed the processing environment, the client may comprise only a specific computer connected to the network, but also such software process, software process that has a connection to another network such a process, and the latter request information, and in response obtained from information provided by the latter. 提供本发明的概述，具体地，在本发明与客户机移动装置中的移动互联网web浏览器一起使用的上下文下的概述，其后对本发明的实现的每个基本组件进行描述。  provide an overview of the present invention, in particular, in the context of the Internet and the mobile client in a mobile device used in the present invention is a web browser with an overview of the basic components for each of the subsequent implementation of the present invention will be described. 本发明根据本公开内容的宽泛发明教导通过以下方式实现匿名独一装置识别:通过在客户机装置执行的移动装置浏览器以对位于移动装置浏览器的用户透明的方式将代码文件(例如ECMA脚本)下载到浏览器高速缓存中；从1)网络、2)网络互联网网关以及3)客户机装置本身检索装置识别信息。  The present invention according to the teachings broad disclosure of the present disclosure achieve anonymous unique device identification in the following ways: by the mobile device browser executing on a client device to a user located in the mobile device browser transparent way code files ( for example, the ECMA script) to download the browser cache; itself from an identification information retrieving means) network, 2) the network 3 and the Internet gateway) client device. 以下述方式对该信息进行处理，即，唯一地识别匿名网络分布式装置，而无需明确提供的装置识别信息(例如，电话号码)或者用户识别信息(例如，浏览器端“小甜饼”)。 In the following manner processes the information, i.e., a distributed network to uniquely identify the anonymous apparatus, and device identification information (e.g., telephone number) or a user identification information (e.g., browser "cookie") without explicitly provided . 具体地，本发明所实施的技术依赖于将静态标记标签嵌入到由内容服务器13传递的内容页面中。  In particular, the techniques of the present invention relies on the embodiment of embedding static tag label to content delivered by the content server 13. 这些静态标签有效地下载移动装置浏览器7中的永久脚本，并对该永久脚本进行实例化。 These static labels effectively downloading the mobile device browser 7 permanently script, and the script permanently instantiated. 该脚本然后透明地执行，以将另外的标记插入到内容中，这随后使移动装置浏览器7对根据本发明的驻存在服务器20上的独一装置识别管理系统400发起请求。 The script is then performed transparently to insert into the content additional markers, which subsequently cause the mobile device browser 7 in initiating the request according to a presence server 400 of the present invention a unique device identification management system 20. 图1B和图1C中共同显示了互联网环境下的本发明的总体部署。  FIGS. 1B and 1C together show the overall arrangement of the present invention in the Internet environment. 图1A中显示了图1B和图1C的图纸的正确对准，图1B在图1C上方。 FIG 1A shows the correct alignment of the drawing of FIG. 1C and FIG. 1B, FIG. 1C above in FIG. 1B. 图2A和图2B共同描绘透明地调用本发明的一般的移动互联网页面xHTML代码和本发明为了将对驻存在服务器20上的外部独一装置识别管理系统400的匿名装置独一识别请求插入到用户请求的内容中而对该内容动态进行的改变，图2中显示了这些图的图纸的正确对准。 2A and 2B together depict the present invention is invoked transparently general mobile Internet code and xHTML pages will reside in the present invention for external unique device identification management system on the server 20 anonymous unique device identification request 400 into the user changing the content request to the content and dynamically, FIG. 2 shows the correct alignment of the drawing of FIG. 为了更好理解，在以下整个论述中，图1B和图1C、图2A和图2B应该被同时提及。 For better understanding, in the following discussion throughout, FIG. 1B and FIG. 1C, 2A and 2B should be mentioned at the same time. 图1B和图1C描绘本发明的互联网环境的框图。  FIGS. 1B and 1C is a block diagram of the Internet environment, the present invention is depicted. 10。 10. 装置浏览器7是常见的移动互联网浏览器，例如可在市面上分别从苹果公司或微软公司买到的IPhone的Safari或者微软的Internet Explorer。 7 is a common device browser mobile Internet browser, for example, are available from Apple or Microsoft in the market IPhone's Safari or Microsoft Internet Explorer. 优选地，由于将很快变清楚的原因，移动装置浏览器优选支持执行ECMAScript。 Preferably, as it will soon become apparent reasons, preferably the mobile device browser supporting execution ECMAScript. ECMAScript是标准脚本语言，其被用在网页中以影响这些网页对于用户的外观或行为。 ECMAScript is the standard scripting language that is used in Web pages to influence these pages for the user's appearance or behavior. ECMAScript是面向对象的，并被认为是可添加任何特定域的对象或者上下文(例如，“文档”概念)的核心语言。 ECMAScript is object-oriented, and are considered to add any object or context-specific domain (e.g., "Document" Concepts) core language. 虽然为了易于对计算机间动作进行举例说明，互联网10被描绘为具有部分IOa和10b，但是本公开内容简单地将这两个部分共称为互联网10。 Although for ease of illustration between the operation of the computer, the Internet 10 is depicted as having a portion IOa and 10b, but the present disclosure is simply total the two parts 10 called the Internet. Web浏览器，或者具体地，通过链路11连接至互联网10的移动网站内容服务器13，表示可在市面上买到的任何web HTTP (超文本传送协议)服务器，并且根据本发明，通过装置浏览器7访问web浏览器，以检索所期望的内容页面。 Web browser, or specifically, through a link 11 connected to the content server 13 to the mobile Internet site 10, represents (hypertext transfer protocol) server at any web HTTP commercially available, and in accordance with the present invention, by means browsing 7 to access a web browser, to retrieve the desired content pages. 虽然设想根据本发明可使用各种HTTP服务器，但是优选实施方案使用微软IIS服务器来配合本系统所用的.NET匿名概要分析系统。 Although contemplated that various HTTP server may be used according to the present invention, but the preferred embodiment uses the Microsoft IIS server with the present system uses .NET Anonymous Profiling system. Web服务器13响应于来自移动装置浏览器7的提取特定文件(例如，用户希望查看的内容页面)的请求通过互联网10使用常见的TCP/IP协议(传输控制协议/互联网协议)将该文件下载到移动装置浏览器7。 Web server 13 in response to the extracted specific file from the mobile device browser 7 (e.g., the user wishes to view the content page) request via the Internet 10 using the common TCP / IP protocol (Transmission Control Protocol / Internet Protocol) to download the file The mobile device browser 7. 移动装置浏览器7继而将通常在移动显示器上(例如，通过蜂窝电话)向位于客户机装置5并观看客户机装置5的用户展现该文件。 The mobile device browser 7 in turn is typically on the mobile display (e.g., via a cellular phone) to the user to show that the file is located in client device 5 and 5 of the client device to watch. 脚本发布HTTP服务器(也称为“脚本服务器”)15通过通讯链路17连接至互联网10，并存储共同实现预定脚本(具体地，ECMAScript)的文件。  release script HTTP server (also called the "Script Server") 15 is connected via a communication link 17 to the Internet 10 and stores together to achieve a predetermined script (specifically, ECMAScript) files. 移动装置浏览器7将该脚本透明地加载到与客户机装置5上的移动装置浏览器相关联的本地内容高速缓存中。 The mobile device browser 7 transparent script loaded into cache and local content associated with the mobile device browser on the client device 5. 脚本服务器15以将在下面描述的方式将脚本下载到客户机移动装置浏览器7。 Script Server 15 in a manner to be described below will script downloaded to the client mobile device browser 7. 该脚本一旦被实例化和启动就透明地将独一装置识别请求插入到移动装置浏览器7随后执行的内容页面中。 The script once instantiated and started to transparently inserted unique device identification request to content page the mobile device browser 7 then executed. 脚本的永久缓存有利地允许在本地执行后面的内容页面，而不是每次改进性能都需要下载。 Permanent cache script advantageously allows content pages later performed locally, rather than each time to improve performance need to download. 脚本使得能从客户机装置5内部捕获独一装置鉴别信息。 Script makes the client device 5 from the inside to capture the unique device identification information. 独一装置鉴别信息被从移动装置浏览器7发送到独一装置识别管理系统400。 It means a unique authentication information is transmitted from the mobile device browser 7 to the Unique Device Identification Management System 400. 独一装置识别管理系统400通过通讯链路23连接至互联网10。  Unique Device Identification Management System 400 is connected to the Internet 10 via communication link 23. 本质上，如以下详细论述，如果特定客户机装置5的全球唯一装置标识符GUID存在于本系统维护的装置概要数据库中，则该系统响应于从在移动装置浏览器7中执行的脚本发起的请求选择该GUID。 Essentially, as discussed in detail below, if the world's only device-specific client device 5 GUID identifier exists in the device profile database maintained by the system, then the system response to be initiated from the script executed in the mobile device browser 7 the request selection GUID. 内容提供商(一个或更多个)将HTML标签40 (其在必要时将该标签与其他HTML标签区分开，以下称为“脚本标签”)嵌入到构成每个推荐链接(referring)网页(比如，这里如图1A所示的内容页面35)的HTML代码中。  a content provider (one or more) HTML tags will be 40 (which is separate from the label and other HTML tags in the zone, if necessary, referred to as "script tags") to constitute each of the recommended links embedded (referring) page (for example, where the contents of the page 35 shown in FIG. 1A) in the HTML code. 通常，该脚本标签40相对于该页面的存在HTML代码(在图2A和图2B中显示为HTML代码部分35a和35b)的位置不是关键性的。 Typically, the script tag 40 is present with respect to the HTML code of the page (shown as HTML code portions 35a and 35b in FIGS. 2A and 2B) the location is not critical. 这些脚本标签40存在两种元素:ECMA脚本元素，如果终端用户装置支持脚本处理，则ECMA脚本元素被执行。  The script tag 40 both elements are present: ECMA script element, if the end user device supports scripting, ECMA Script element is performed. 用于这种实现的脚本基于OMA 2006 ECMA脚本标准V1.0 (2006年10月)，并完全遵循该标准的所要求的各方面。 This script-based implementation for OMA 2006 ECMA script standard V1.0 (October 2006), and fully comply with all aspects of the standards required. 最后,“〈noscript〉…〈/noscript〉”元素被嵌入在内容中，仅当终端用户客户机装置5不支持ECMA脚本或者在客户机装置5内不启用ECMA脚本时,“〈noscript〉…〈/noscript〉”元素才被执行。 Finally, "<noscript> ... </ noscript>" element is embedded in the content, only when an end user client device 5 does not support the ECMA script or ECMA script is not enabled in the client device 5, "<noscript> ... < / noscript> "element was only implemented. 这种实现确保无论客户机装置5是否支持ECMA脚本，在内容页面中总是执行独一装置识别管理系统请求。 This implementation ensures that regardless of the client device 5 supports ECMA script, always perform unique device identification management system request content pages. “/site =mysite/”指令之后显示的所有元素与对于任何移动精准定向广告(targeted ad)将预计看到的元素相同，这些额外的精准定向值使用name = value虚拟目录路径格式指定。 "/ Site = mysite /" all elements displayed after the instruction is expected to see the same element for any mobile precision targeted advertising (targeted ad), the precise orientation of these additional values ​​specify virtual directory path name = value format. 脚本文件可从如图1B所示的脚本服务器15动态地产生，或者被脚本服务器15作为静态文件传递。  The script file may be dynamically generated from a script server shown in FIG. 1B 15, or 15 is transmitted as a static script file server. 具体地，可将脚本缓存在移动装置浏览器内容高速缓存中。 Specifically, the script may be cached in the mobile device browser cache content. 如果适当的话，为了确保仅在第一次服务脚本时通过网络加载脚本，动态地产生合适的HTTP头。 If appropriate, in order to ensure that the load only when the first network service script by script, dynamically generate the appropriate HTTP header. 无论是在会话内还是在后面的会话期间，都可从本地内容高速缓存直接获得用户的后面内容页面导航。 Whether it is in session or during a session behind, you can get behind the user's page navigation content directly from local content cache. 无需通过网络进行另外的加载。 Without the need for additional load over the network. 如果高速缓存被清除，则所述过程仅在下一次独一装置识别管理系统请求标签被展现时重复刷新脚本。 If the cache is cleared, the process once the unique device identification management system request is presented only on the next label repeatedly updated script. 有利的是，非常少见的，如果真有的话，对这些代码部分进行任何需要的改变，以适应脚本标签40。  Advantageously, very rare, if at all, on the part of the code any changes needed to adapt the script tag 40. 如所示并如下表1再现，实现根据本发明的脚本标签的代码。 As shown in Table 1 below and reproducing, according to the script implementation code label of the present invention. 当广告标签(“src = http://ringleaderadserver.com/iserver/scriptsite=mediastamp ? /site = mysite/<name> = <value>/<name> = <value>/<name> =〈value〉”)被移动装置浏览器7执行时，该广告标签的一部分从如图1B所示的脚本服务器15下载脚本文件。  When the ad tag ( "src = http://ringleaderadserver.com/iserver/scriptsite=mediastamp? / Site = mysite / <name> = <value> / <name> = <value> / <name> = < value> ") when the mobile device browser 7 is performed, a portion of the ad tag from the script 15 script file download server shown in FIG. 1B. 移动装置浏览器7继而将该文件作为脚本进行解释和执行。 The mobile device browser 7 then the file as script interpretation and execution. 如图2B所示的块200所表示的执行该脚本的效果是将通过该脚本动态编写的独一装置识别管理系统请求标签代替脚本标签40插入到推荐链接网页中，以形成驻存在移动装置浏览器磁盘高速缓存中的修改的网页，这里为推荐链接内容页面35'。 The effect of executing the script indicated by the block 200 shown in FIG. 2B is a dynamic script prepared by the unique device identification management system request script tag label 40 is inserted into place links to pages, to form a mobile device browser residing disk cache of modified pages, 35 pages here 'recommended links content. 这些插入的标签共同形成对独一装置识别管理系统400的请求，如本领域技术人员将意识到的，独一装置识别管理系统400被实现为服务器。 These together form a label insertion request unique device identification management system 400, as those skilled in the art will appreciate, the Unique Device Identification Management System 400 is implemented as a server. 如以下详述并且如以下表2再现，当该请求被移动装置浏览器7解释和执行时，该请求发起对src(src =以下所示部分)所指定的地址的HTTP请求。 As detailed below, and reproduced in the following Table 2, when the request is interpreted and executed 7 the mobile device browser, an HTTP request for requesting the src (src = section shown below) specified by the address. src="http://dd.ringleaderdigital.com/iserver/SR=l/site=RLDMS/MOPHAP ADFORMA T=MOAGENT/XZl SITE=RLDMS/XZlMOPHAPADFORMAT=MOBANNER" src = "http://dd.ringleaderdigital.com/iserver/SR=l/site=RLDMS/MOPHAP ADFORMA T = MOAGENT / XZl SITE = RLDMS / XZlMOPHAPADFORMAT = MOBANNER"
 本发明允许对来自任何装置浏览器或者装置应用程序的HTTP独一装置识别管理系统请求作出响应。  The present invention allows the response to the HTTP request to the Unique Device Identification Management System apparatus from any browser or device applications. 它使用嵌入在请求URL中的“路径”信息来确定正以何种方式为哪个发行者服务。 It uses the information embedded in the "path" in the request URL to determine which is the positive manner in which the issuer services. 该路径中的第一级“目录”通常包含如以下实施例中的告诉独一装置识别管理系统400以何种方式处理请求的指令:http: //Server, domain, com/iserver/SITE =YourSite>/<name> = <value>/<name> =〈value〉/ 在这种情况下，“ iserver” 部分告诉广告服务器返回包含适合于传递发行者“YourSite”的⑶ID的响应，并将该响应作为对外部服务器的重定向响应返回给移动装置浏览器。 A first stage of the path "directory" generally contain as the embodiment tell unique device identification management system of the embodiment of the manner in which instruction 400 processing requests: http: // Server, domain, com / iserver / SITE = YourSite > / <name> = <value> / <name> = <value> / in this case, "iserver" section tells the ad server returns a response adapted to pass issuer "YourSite" of ⑶ID, and the response as the external server redirect response back to the mobile device browser. 存在可用于开发适合于各种服务模型的响应的指令(directive)。 It exists for developing instructions adapted to model the response to various services (directive). 有利的是，本发明的方法提供从外部ECMA脚本文件插入如所期望的那么多的请求机制的灵活性，该外部ECMA脚本文件的代码将在内容布局期间被执行。  Advantageously, the method of the present invention to provide as much flexibility to request mechanism is inserted from the outside as desired ECMA script file, the code of the outer ECMA script file to be executed during the content layout. 该代码执行所期望的任何预处理或环境检测，并且对于用户是透明的。 The code to perform the desired pre-treatment or any environmental testing, and is transparent to the user. 使用这种实现形式的一个问题是不支持ECMA脚本显示“没有广告”的那种旧式装置。  With this realization in the form of a question is that does not support the ECMA script shows "no advertising" the kind of old-style device. 因此，此刻，目前本发明被阻止将这种机制部署为单一跨平台解决方案。 Therefore, at the moment, currently present invention is to prevent such a mechanism will be deployed as a single cross-platform solution. 直到旧式装置从市场上退出为止，才使用分离的连接的“〈noscript〉...〈/noscript〉”标记标签集来实现故障降低(graceful degradation)。 Until the legacy devices withdrawn from the market so far, the use of only "<noscript> ... </ noscript>" tag label isolated connection failure to achieve reduction set (graceful degradation). 只有当客户机装置不支持外部ECMAScript请求时,才执行嵌入在点击次数锚标签(click through anchor tag)中的传统图像请求。 ECMAScript only when the external device does not support the client request only when embedding is performed in a conventional image request Clicks anchor tags (click through anchor tag) in. 如果客户机装置支持ECMAScript，则“noscript”开始标签和结束标签之间的请求不被执行，并被展现为无功能。 If the client device supports the ECMAScript, the request between the start and end tags "noscript" is not performed, and is presented as non-functional. 不同的浏览器提供不同级别的脚本处理复杂性。  Different browsers offer different levels of the scripting complexity. 装置检测使得定制脚本处理功能可适应每种装置的性能。 Means for detecting that a custom script processing performance of each device can be adapted. 实施例中“？ ”查询字符串之后的参数构成网站的精准定向标准，并被提取和插入到动态产生的ECMAScript函数中。 Example of "?" Parameter query string and after the precise orientation of standard site, and inserted into and extracted ECMAScript functions dynamically generated. 这些脚本函数在装置中产生特定于查询网站字符串参数的独一装置识别请求机制。 These scripts unique device identification functions to produce a particular site in the query string parameter in the request mechanism in the apparatus. 当在装置内部执行该脚本时，这些目标被动态地插入在内容中。 When the script is executed inside the device, these objects are dynamically inserted content. 如果ECMAScript不被支持，或者不被客户机装置启用，则在“〈noscript〉...〈/noscript〉”标签集中执行前面所述的、表2所示的脚本动态产生的广告图像和点击次数广告请求的等同形式。  If ECMAScript is not supported or not enabled client device, the centralized execution of the label in front of the script shown in Table 2 dynamically generated "<noscript> ... </ noscript>" in the advertisement image and clicks an ad request equivalents. 这些标签是静态的，被所有装置支持，并提供确保客户机端独一装置识别管理系统请求总是被执行的机制。 These labels are static, supported by all devices, and provide mechanisms to ensure the client side unique device identification management system request is always executed. ECMAScript提供“〈noscript〉...〈/noscript〉”标签集不支持的附加请求功能，例如本地装置时间地区信息。 ECMAScript provides "<noscript> ... </ noscript>" tag in the set does not support the request additional features, such as local region time information means. 现在，根据头脑里的前面的说明并具体参照图1B和图1C，现在将对与本发明的使用相关联的基本计算机间动作以及在客户机装置中发生的基本伴随处理步骤进行描述。  Now, according to the foregoing description in mind, and with particular reference to FIGS. 1B and 1C, the basic inter-computer will now associated with the use of the present invention is concomitant with the operation and basic processing steps that occur at the client device will be described . 为了开始浏览会话，用户首先调用客户机装置5的移动装置浏览器7。  To begin browsing session, the user first calls the client mobile device browser 7 of the device 5. 一旦移动装置浏览器7正在执行，移动装置浏览器7就获得标号31所指代的这个内容页面和地址的选择作为初始网页，所述地址为前面所谓的“默认”内容页面或者先前由用户指定的“加书签的页面”的地址或者由用户手动键入的内容页面的地址，所述“加书签的页面”具有其存储在移动装置浏览器7中的URL。 Once the mobile device browser 7 is being executed, the mobile device browser 7 to obtain the content page and selection of the address of the referenced numeral 31 as an initial web page, said address is a preceding so-called "default" previous page or content specified by the user address "bookmarked page" address or entered manually by the user of the content page, the "bookmarked pages" having the URL stored in the mobile device browser 7. 如块33所示，客户机装置5的移动装置浏览器7然后通过包含该页面的URL( S卩，其包括其文件名的完整的互联网地址)的请求34发出提取该内容页面35的文件的请求。 , The client device mobile device browser 7 then 5 contains a URL of the page (S Jie, which includes the file name of the full Internet address) is sent a request as indicated by block 3334 extracts the document content page 35 request. 为了简化，假设该页面的文件驻存在内容服务器13上。 For simplicity, assume that the page file residing on the content server 13. 还假设内容页面35正被请求，这将调用根据本发明的相关联的匿名独一装置识别管理请求。 35 is also assumed that the contents of the page being requested, which will invoke the anonymous unique identification management request associated with a device according to the present invention. 响应于如线34所示的被路由到内容服务器13的请求，如线36所示，该特定服务器将内容页面35的文件下载到客户机装置5，其中，存储在该文件中的代码包含脚本标签40。 As shown, in response to the line 34 is routed to the contents server request 13, as shown by line 36, the contents of the page to download a specific file server 35 to the client device 5, wherein the code is stored in the script file contains label 40. 该脚本标签40的示例性内容显示在虚线块45以及图2A和图2B中。 The exemplary content script tag 40 is shown in dashed lines and block 45 in FIG. 2A and Figure 2B. 一旦在如图1B所示的客户机装置5接收到该文件，移动装置浏览器7就如块52所示的那样对内容页面35中的包括脚本标签40的HTML代码进行解释，然后执行该HTML代码，并且因此，开始进行脚本下载/实例化/执行操作50中显示的动作。  Once the client device 5 shown in FIG. 1B receives the file, to the mobile device browser 7 as shown in block 52 as the HTML code for the content page 40 includes a script tag 35 will be explained, and then executing the HTML code, and thus, start the download scripts / instantiate / 50 performs operation shown in operation. 这些操作最终导致在客户机装置5的移动装置浏览器7中脚本标签40被下载、实例化和启动。 These operations eventually resulting in a client device of the mobile device browser 7 5 script tag 40 is downloaded and instantiated start. 一般来讲，移动装置浏览器7如线54所示的那样响应于执行脚本请求标签对脚本服务器15发出提取脚本的请求，以下载脚本。 In general, as shown in response to the mobile device browser 7 as indicated by line 54 requesting execution of the script requests the tag extracted script to the script server 15 to download the script. 通过各种过程间操作，脚本服务器15如线56所示的那样访问并下载返回的脚本，安装独一装置识别管理请求以在客户机装置上的移动装置浏览器7下执行的脚本的所需文件。 By between various process operations, the script access Script Server 15 as shown by line 56 and returned to download, install unique device identification management request to a script on the client device at the mobile device browser 7 executes the desired file. 一旦脚本文件被下载到客户机装置上的移动装置浏览器高速缓存，移动装置浏览器7就如块58所示的那样进行实例化，并启动脚本执行。 Once a script file is downloaded to the mobile device browser on the client device cache, the mobile device browser 7 As examples of the block 58 as shown, and start the script execution. 在客户机装置5中的移动装置浏览器7执行的脚本从客户机装置5内部读取另外的独一装置识别信息，为列举代表性的实施例，所述另外的独一装置识别信息例如客户机装置、时钟和时间地区设置、以前在可被脚本访问的客户机装置5中设置的任何独一装置检测“小甜饼”值以及关于移动装置浏览器7本身的版本号的信息。 Script  The mobile device browser in the client device 5 7 performs reading additional unique device identification information from inside the client device 5, to include a representative embodiment, the additional unique device identification information such as client devices, regional settings and time clock, only a device to detect any previously set in the client device 5 scripts can be accessed in the "cookie" value and information about the mobile device browser 7 version of itself . 这些值被作为关键字(关键字=值参数)附加到独一装置识别管理系统请求互联网URL地址。 The value is appended as a keyword (keyword = value of the parameter) to the unique device identification management system request Internet URL address. 如块58所示的那样，脚本然后动态地将直接独一装置识别请求标签插入到内容页面35中的HTML代码中。 As shown in block 58, then dynamically the script directly unique device identification request tags into the content of the page 35 in the HTML code. 一般来讲，移动装置浏览器7如线60所示的那样响应于执行动态插入的独一装置识别请求标签对通过通讯链路23连接至互联网IOb的独一装置识别管理系统400发出装置识别请求。 Generally, the mobile device browser 7 as shown by line 60 in response to execution as dynamically inserted unique device identification request tags identifying means for issuing a request to connect to the Internet via a communication link 23 IOb Unique Device Identification Management System 400 . 驻存在服务器20上的独一装置识别管理系统400通过通讯链路23连接至互联网10b，并存储以前请求过独一装置识别的客户机装置的独一装置识别概要。  in the presence of the unique device identification management server system 20, 400 are connected to the Internet 23 via communication links 10b, and stores the previously claimed a schematic unique device identification of the client device's unique device identification. 本质上，并且如以下详细论述，如果特定客户机装置5的GUID存在于独一装置概要数据库430中，则该系统响应于被在移动装置浏览器7中执行的脚本动态插入的请求选择该GUID。 Essentially, and as discussed in detail below, GUID if a particular client device 5 is present in the Unique Device Profile database 430, then the system in response to the script is executed in the mobile device browser 7 dynamically inserted request selection of the GUID . 它如线65所示的那样将重定向的GUID返回给客户机装置5，客户机装置5继而如线95所示的那样将⑶ID重定向到使用⑶ID的第三服务器的互联网地址。 As will be redirected GUID shown by line 65 returns it to the client device 5, then the client device 5 as indicated by line 95 as shown ⑶ID will be redirected to the third server using the Internet address of ⑶ID. 在具有不支持脚本的移动装置浏览器7的客户机装置5的情况下，移动装置浏览器7响应于展现静态嵌入在内容页面35中的〈noscript〉…〈/noscript〉标签执行如图1C所示的块90。  In the case where the client device has no scripts mobile device browser 7 5, the mobile device browser 7 in response to the presentation of static embedded in <noscript> 35 contents page ... </ noscript> tag to perform the block 90 shown in FIG. 1C. 不是将对独一装置识别管理系统400的请求动态插入到内容页面35中，移动装置浏览器7展现嵌入在〈noscript〉…〈/noscript〉标签之间的标记,并如线98所示的那样对通过通讯链路23连接至互联网IOb的独一装置识别管理系统400发出请求。 Will not unique device identification management system request 400 is inserted into the dynamic content page 35, the mobile device browser 7 exhibits embedded in <noscript> ... </ noscript> tag between the tags, as shown by line 98 and as request to connect to the Internet via the communication link 23 IOb unique device identification management system 400. 在上述任一情况下，驻存在服务器20上的独一装置识别管理系统400如图1C上的线65所示的那样将响应重定向返回给移动装置浏览器7。  In either case, residing on the line 400 in FIG. 1C unique device identification management system on the server 20 as the response returned to redirect the mobile device browser 7 as shown in 65. 与客户机装置5匹配的GUID被作为包括在重定向响应的头中的HTTP协议互联网地址的一部分并入。 5 with the GUID matches the client device is used as part of the protocol header comprises an HTTP redirect response in the Internet address is incorporated. 移动装置浏览器7然后执行如图1C中的块91所示的重定向过程，GUID被作为图1C上的线95所示的重定向请求的一部分发送到如图1B所示的第三服务器70。 The mobile device browser 7 then performs the redirect process shown in block 91 in FIG. 1C, GUID is used as the third server sends a redirect the line 95 as shown in FIG. 1C on the part of the request 70 shown in FIG. 1B . 本发明能确定当移动广告活动被独一访客观看时移动广告活动如何执行。  The present invention can determine when a mobile campaign is only when a visitor to watch how mobile advertising campaign execution. 当第一次访客进入网站时，该访客可与来自本发明的独一装置识别管理系统400的全球唯一标识符(GUID)相关联。 When first entering the site visitor, the visitor may be associated with the unique device identification management system of the present invention from a global unique identifier (GUID) 400 a. 使用这个GUID，广告服务器可记录对于独一访客的展示次数和由该独一访客执行的点击次数。 Use this GUID, the ad server to record impressions and unique visitors clicks performed by the unique visitors. 在一个实施方案中，可实时地将该GUID作为如正下面的实施例1所示的这些系统中的到creative的“？”重定向之后的查询字符串或者作为关键字(关键字=包含在实施例2所示的重定向URL的路径部分中的值精准定向参数)从本发明的独一装置识别管理系统400传递到外部系统,例如,代理仪表盘审计(agency dashboard audit)系统。 In one embodiment, the GUID may be real time, as these systems are as shown in Example 1 below in the embodiment of the creative "?" After redirection or query string as a keyword (keyword contained in = value of the path portion redirect URL shown in the embodiment in precise orientation parameters) transmitted from the unique device identification management system 400 of the present invention to an external system, e.g., the agent dashboard audit (agency dashboard audit) system. http://eyeblaster`.com/creative, gif ? GUID = 6723591  http: //eyeblaster`.com/creative, gif GUID = 6723591? 本领域技术人员将意识到，代理仪表盘审计系统是买方工具。  Those skilled in the art will appreciate that the agent dashboard audit system is a buyer tool. 其实施例为DART、Eyeblaster和Microsoft Atlas Media Console。 Embodiments thereof as DART, Eyeblaster and Microsoft Atlas Media Console. 广告商使用这些工具来管理可径直穿过数字信道的在线广告活动。 Advertisers use these tools to manage online advertising campaigns can be directed through a digital channel. 他们通常服务于创意，并跟踪跨多个站点的广告商活动。 They usually serve the creative, and advertisers to track activity across multiple sites. 这些公司提供的工具通常被称为仪表盘，它们允许广告商和它们自己在以下方面对活动如何进展进行监控:当独一用户访问网站内容时消费广告的独一用户的数量、总计传递的和由网站传递的展示次数以及用户的点击次数、ROI等。 These companies offer tools commonly referred to as the dashboard, they allow advertisers and their own on how to monitor the progress of activities in the following areas: When the number of unique users of unique users accessing Web content consumer advertising, and the total transfer impressions, and user clicks delivered by the website, ROI and so on. 因此，代理仪表盘审计系统的关注点在于广告商，而不是发行者，并提供对品牌广告活动和广告商如何做进行监控的实时报告和度量仪表盘。 Therefore, the focus of the agent dashboard audit system is that advertisers, rather than the issuer, and provide real-time reporting dashboards and metrics on how to brand campaigns and advertisers do the monitoring. 这些系统最终确定哪些发行者得到报酬，因此，起到对活动的度量进行计数的审计的作用。 The system will eventually determine which publishers get paid, therefore, acts as a measure of the activity of counting audit. 通常，网站得到传递给它们的内容受众的每千个广告的一定成本，因此，这些代理仪表盘审计系统还被用于检查发行者所说被传递的广告个数和当被传递给实际用户时实际计数的广告个数之间的差异，并且他们最终对广告商就他们的活动的执行负责。 Typically, the website gets passed to certain cost per thousand advertising content of their audience, therefore, these agents dashboard audit system is also used to check the publisher said, and when the number of ads to be delivered when the user is passed to the actual the difference between the actual count of the number of ads, and they ultimately responsible for the execution of their activities advertisers. 图3描绘客户机装置5的框图。  FIG. 3 depicts a block diagram of the client device 5. 客户机装置5包括输入接口(I/F) 320、处理器340、通讯接口350、存储器330和输出接口360，所有这些常规地通过总线370互连。 Client device 5 comprises an input interface (I / F) 320, processor 340, communications interface 350, memory 330 and output interfaces 360, all conventionally interconnected by bus 370. 存储器330通常包括不同形态，包括示例性的随机存取易失性存储器(RAM) 332、用于临时数据和指令储存的非易失性RAM 334以及使用永久静态存储器实现的非易失性存储器335。 The memory 330 typically includes various forms, including the exemplary random access volatile memory (RAM) 332, for temporary data and instruction store non-volatile RAM 334 and nonvolatile memory 335 to achieve permanent static memory . 非易失性存储器335存储操作系统(0/S)337和应用程序400，后者示例性地包含移动装置浏览器7(参见比如图1B和图1C)。 The nonvolatile memory 335 stores an operating system (0 / S) 337 and application programs 400, which illustratively comprises a mobile device browser 7 (see for example FIG. 1B and FIG. 1C). 任何常见的移动操作系统可实现0/S 337，例如AppleMobile 0/S、Windows Mobile 5 或6 操作系统(“Windows Mobile 5，，、“Windows Mobile6”是美国华盛顿州雷德蒙德的微软公司的商标)。考虑这里不提供0/S 337的组件的详细论述，而0/S 337的组件是本领域技术人员公知的。可以肯定地说，作为应用程序405之一的移动装置浏览器在操作系统的控制下执行。 Any common mobile operating system can achieve 0 / S 337, for example AppleMobile 0 / S, Windows Mobile 5 or 6 operating system ( "Windows Mobile 5 ,,," Windows Mobile6 "Washington is Microsoft's Redmond trademark). consider here does not provide a detailed discussion of the components of 0 / S 337, and component 0 / S 337 of the skilled person known to be safe to say that, as an application the mobile device browser to one of the 405 in operation performed under system control. 输入信息可产生于两个示例性外部源:比如，通过通讯链路9从移动互联网和/或其他联网设施到通讯接口350的或者通过路径310从专用输入源到输入接口320的网络提供信息。  The input information may be generated in two exemplary external sources: for example, by a communication link 9 from the mobile Internet and / or other networked facility, or to communication interface 350 via path 310 from a dedicated input source to the input interface 320 of the network provide information. 专用输入可来自多种源，比如，外部USB端口或者将苹果的IPhone与使用苹果的ITunes店面计算机应用程序将应用程序加载到其中的计算机连接的专用接口。 Dedicated input from a variety of sources can be, for example, a USB port or an external Apple Apple ITunes IPhone using storefront application computer application which is loaded into a dedicated interface connected to the computer. 输入接口320包括提供物理连接所需的必要的且相应的电气连接的适合电路，并且每个接口用于针对客户机装置5的不同专用输入信息源。 The input interface 320 includes the necessary circuitry and the corresponding physical connection required for electrical connection, and each interface for a different specific client device 5 for input sources. 在0/S 337的控制下，应用程序400通过网络连接9或路径310与外部源交换命令和数据，以在程序执行期间发送和接收通常由用户请求的信息。 Under the control of 0 / S 337, the application 400 connected to network 310 via path 9 or with an external source exchange commands and data, transmit and receive information typically requested by a user during program execution. 输入接口320还与客户机装置5的用户输入装置395 (例如，键盘或触摸屏)电连接和相互匹配工作。 User  The input interface 320 and the client device 5 further input device 395 (e.g., keyboard or touch screen) and electrically connected to each other to match work. 显示器380 (例如常见的液晶彩色面板)通过导线363连接至输出接口360。 Display 380 (e.g., common color liquid crystal panel) 363 is connected to the output interface 360 ​​via a wire. 输出接口360提供与系统电连接和相互匹配工作的必需电路。 Output interface 360 ​​electrically connected to the system and to provide matched circuitry necessary work. 此外，由于除了实现本发明的模块之外的客户机装置5的特定硬件组件以及存储在存储器335内的软件的方面是常见的、公知的，所以将不对它们进行任何进一步详细的论述。  Further, since in addition to achieving the client device other than the module of the present invention in software 5-specific hardware components and stored in the memory 335 are common, well-known, it will be any further detailed discussion thereof is not . 一般来讲，如图1B所示的脚本服务器15和独一装置信息管理系统400每个具有与客户机装置5加上用于永久软件和数据存储的本地磁盘的架构非常类似的架构。 In general, script server 15 and a unique device information management system architecture shown in FIG. 1B 400 each having a local disk together with the client device 5 and for permanent data storage software very similar architecture shown in FIG. 图4描绘以上论述的独一装置识别管理系统400的简化的高级装置性能检测系统的示图。 A simplified high-level diagram of device capabilities detection system  FIG 4 depicts discussed above Unique Device Identification Management System 400. 如所示，该系统包含显示为装置性能检测系统410的装置性能系统和独一装置概要管理系统420。  As shown, the system includes a display device for the performance of the detection system and device performance of the system 410 of the Unique Device Profile Management System 420. 在401从图1B的移动装置浏览器7接收的装置识别请求HTTP头信息包含装置特定参数(例如，装置制造商和型号)以及独一装置识别管理系统400的HTTP地址中的参数(该参数=通过图1B的脚本处理50确定的值属性)。 401 requesting device identification of the mobile device browser to FIG. 1B 7 received from the HTTP header information comprising device-specific parameters (e.g., the device manufacturer and model) and HTTP address Unique Device Identification Management System 400 of the parameters (parameter = the processing value 50 is determined by the properties of the script of FIG. 1B). 本实施方案中的装置性能检测系统410使用开放源代码WURFL软件，开放源代码WURFL软件为装置性能和很多种应用程序编程接口的数据库。 Device capabilities detection system  410 of the present embodiment WURFL use of open source software, open source software WURFL device capabilities database, and a wide variety of application programming interfaces. “WURFL代表无线统一资源文件。它是关注于在各种无线装置上呈现内容的问题的FOSS (其代表免费和开放源软件)社团成果的一部分。WURFL本身为題L.配置文件，其包含关于装置性能和各种移动装置的特征的信息。装置信息由全球开发者贡献，并且WURFL被频繁更新以反映市场上出现的新的无线装置。Luca Passani 为WURFL 后面的椎云力力。，Tittp: "en.wikipedia.0rg/wiki/WURFL。 "WURFL on behalf of the wireless universal resource file. It is focused on FOSS present content on a variety of wireless device problems (on behalf of its free and open source software) .WURFL part of the community itself is the outcome of the title L. configuration file that contains information about the information means information about device performance and contribution feature a variety of mobile devices by the global developer and WURFL is frequently updated with new wireless devices to reflect the market's .Luca Passani to WURFL cloud behind the vertebral force force, Tittp. : "en.wikipedia.0rg / wiki / WURFL. WURFL数据库中的每个独一装置包含与识别许多移动装置的性能和特征的信息相关联的装置识别用户代理字符串。 WURFL database for each unique device comprises a device identification and the user identification number of performance features of the mobile device proxy information associated string. WURFL部署在全球载体和门户站点，并被记载在http://wurfl.sourceforge.netο另外，许多商业上可获得的具有增值特征的实现可从例如Ripcode的卖主处购买。 WURFL deployed in the global carrier and portal sites, and is described in http: //wurfl.sourceforge.netο In addition, many implementations with value-added features available commercially available from vendors such as at the Ripcode. WURFL系统使用图4中的线401所示的、在图4中的装置性能检测系统410接收的合适的HTTP协议头来提取特定于请求装置制造商和型号的性能，并将它们作为/capability = value/对插入在对图4中的独一装置概要管理系统420的输出HTTP请求中，所述HTTP协议头具有来自图1B中的移动装置浏览器块7的独一装置识别管理系统请求。 Suitable HTTP protocol device capabilities detection system 410 in FIG. 4 extracts the received up to the performance of a device-specific manufacturer and model of the request, and are shown as lines 4  WURFL system 401 of FIG. / capability = value / output inserted in a HTTP request to the unique device Profile management system 420 in FIG. 4, the HTTP protocol header block having a browser from a mobile device of FIG. 1B unique device identification management system 7 request. 装置性能检测系统410将装置特定配置值附加到线401所示的HTTP请求中的输入路径部分，该HTTP请求具有典型的输出请求URL，该输出请求URL的后面为其相关联的HTTP trace。  The device capabilities detection system 410 of the device specific configuration value to the input path of the HTTP request shown in line 401, the HTTP request URL having a typical output request, the output end of the URL HTTP request its associated trace. 根据优选实施方案，装置性能检测系统410将客户机装置5性能作为/keyword=value/对附加到从请求客户机装置5的移动装置浏览器7接收的输入互联网地址URL，然后将该请求重定向到独一装置概要管理系统420。 According to a preferred embodiment, the device capabilities detection system 410 to the client device 5 as performance / keyword = value / URL Internet address input 7 is attached to a request received from the client browser device moving device 5, and then redirect the request the unique device Profile management system 420. 扩展路径被传送到独一装置概要管理系统420。  The propagation path is transmitted to the Unique Device Profile Management System 420. 该系统在商业上是可获得的，并可获得开放源代码，将不对其进行进一步论述。 The system is commercially available and open source available, and will not be discussed further. 为了实现本系统的目的，“WURFL”系统被用作开放源代码装置检测实施例，RipCode的TransAct检测器(TransAct Detector)装置检测系统被用作商品牵施例，即，http://www.ripcode.com/products/detector.php0 它被当作黑盒子交钥匙系统(black box turn key system),该系统提供装置识别鉴别符以及输Λ IP主机地址到载体IP块的查找转变，所述装置识别鉴别符基于特定型号和制造商装置的客户机装置性能。 For the purposes of the present system, "WURFL" system is used as means for detecting the open-source embodiment, the RipCode TransAct detector (TransAct Detector) system is used as means for detecting product led embodiment, i.e., http: // www. it is treated as a black box ripcode.com/products/detector.php0 turnkey systems (black box turn key system), the system provides a means to identify the discriminator and an output Lambda IP host address to IP lookup transition support block, said means identification discriminator means based on the particular performance of the client device manufacturer and model. 每个载体被分配它们所特有的一个或更多个IP地址块，该IP地址块被作为“/carrier = stringvalue/”附加到输出URL虚拟目录路径。 Each carrier is assigned their unique one or more blocks of IP addresses, the IP address block is a "/ carrier = stringvalue /" appended to the output virtual URL directory path. 如果图1B所示的客户机装置5启用并支持所提出的独一装置识别管理系统400的⑶ID “小甜饼”，则图1B所示的移动装置浏览器7自动在标准HTTP互联网协议“小甜饼”头中发送该⑶ID “小甜饼”，如图4中的线401所示，在装置性能检测系统410接收标准HTTP互联网协议“小甜饼”头。  7 automatically if the Internet standard HTTP client shown in FIG. 1B and supporting means 5 enable the unique device identification management system 400 of the proposed ⑶ID "cookies", the mobile device browser shown in FIG. 1B protocol "cookie" header in the transmission ⑶ID "cookie", as shown in FIG. 4 line 401, the apparatus 410 receives the standard HTTP Internet protocol performance Measurement system "cookie" header. 如图4上的线418所示，该“小甜饼”信息被传递到独一装置概要管理系统420，在独一装置概要管理系统420中，该“小甜饼”信息被独一装置“小甜饼”测试419执行。 As shown on line 4, the "cookie" information is transmitted to the Unique Device Profile Management System 420 418 in the Unique Device Profile Management System 420, the "cookie" information is a unique device " cookies "419 test execution. 随后对独一装置“小甜饼”测试419的详细处理进行详细描述。 Then the only means of "cookies" detailed processing 419 tests described in detail. 独一装置概要管理系统420使用通讯信道418所示的服务器到服务器重定向从装置性能检测系统410接收HTTP请求。 Server shown in  Unique Device Profile Management System 420 uses a communication channel 418 to a redirect server receives HTTP requests from the device capabilities detection system 410. 独一装置识别概要系统428对装置鉴别关键字(该装置鉴别关键字=来自请求URL的值)进行解析，并捕获所有的HTTP协议头和任何浏览器“小甜饼”，并且如果该装置过去请求过独一装置识别请求，则使用数据库通讯信道429将它们存储在独一装置概要数据库430中的存在概要中。 SUMMARY Unique Device Identification system 428 pairs apparatus authenticating key (this authenticating key = value from the device of the request URL) parsing, and captures all the HTTP protocol headers and any browser "cookies", and if the device past He requested a unique device identification request, the communication channel 429 using the database to store them in the presence of the unique device profile database 430 of the summary. 与该装置概要对应的概要具有其检索的⑶ID，该⑶ID被附加到以前的关键字(该关键字=来自请求URL路径的值)，并通过客户机装置5的发起移动装置浏览器7被重定向回图1B中的第三服务器地址70。 And having its retrieval ⑶ID schematic outline corresponding to the apparatus, which is attached to the previous ⑶ID keyword (keyword = values ​​from the requesting URL path), and is reset by the originating mobile device browser 7 of client device 5 FIG. 1B directed back to the third address of the server 70. 如果这是客户机装置5第一次发出独一装置识别请求，则产生新的全球唯一标识符，并将它和所有的HTTP协议头和值以及通过路径418输入的URL “/keyword = value/”存储在它在独一装置概要数据库430中的新分配的概要中。  If this is the client device 5 emits the first unique device identification request, generates a new globally unique identifier, and it and all the HTTP protocol headers and values ​​and the URL input through a path 418 "/ keyword = value / "in its newly assigned unique device profile database 430 store the summary. 装置概要GUID被附加到以前的关键字(该关键字=来自请求URL路径的值)，并通过发起装置浏览器5被重定向回图1B中的第三服务器地址70。 SUMMARY GUID means is attached to the previous keyword (keyword = values ​​from the requesting URL path), and by initiating means 5 is redirected back to the browser the address of the third server 1B 70 FIG. 根据优选实施方案，如以下参照图7所述，独一装置概要管理系统420接收互联网HTTP请求,并检索作为“property = value”三元组的请求HTTP协议头名称及其值的预配置分级列表。 Pre  According to a preferred embodiment, as described below with reference to FIG. 7, the Internet 420 receives the unique device profile management system HTTP request and the HTTP protocol header retrieval request as the name and the value "property = value" of triplets Configuring hierarchical list. 独一装置概要管理系统420对客户机装置性能和作为“属性=值”三元组的、来自请求URL的输入互联网地址路径部分的客户机装置识别“/keyword = value/”参数进行解析，并永久地将由独一装置概要管理系统420分配给客户机装置的概要中的所有“property = value”三元组存储在独一装置概要数据库430中。 Unique Device Profile Management system 420 and the client device performance as "attribute = value", the client device identification Internet address input request URL from the path portion of the triples "/ keyword = value /" parameter parsing, and 420 will be permanently assigned unique device profile management system to all a "property = value" triples stored outline client device in a device profile in the database 430 only. 为被分配给输入移动装置浏览器请求的当前概要，检索存储在每个客户机装置概要中的所有“property = value”三元组子集的预配置分级列表，并且检索存在于数据库中的所有这样的客户机装置概要，这些客户机装置概要与当前请求概要中的预配置分级列表中的第一个最高权重“property = value”三元组的值匹配。  The outline of the current input is allocated to the mobile device browser request, retrieves all stored in the summary of each client device in "property = value" a pre-configured hierarchical list of a subset of triplets, exists in the database and retrieve All such client device in summary, the device profile and the current client request pre-configured hierarchical list in the first outline highest weight "property = value" matching value triples. 独一装置概要管理系统420然后依次排除与列表中每个“property = value”三元组不匹配的概要，直到单个概要被留下或者所有“property = value”三元组被使用为止。 Unique Device Profile Management System 420 then successively exclude each list "property = value" triplet profiles not matching until a single profile is left or all "property = value" is used until the triplets. 如果单个概要被留下，则该概要被识别为在数据库中根据来自同一客户机装置的先前请求更新的当前请求客户机装置概要。 If a single profile is left, that profile is identified as the device profile in the database based on the current request from the same client device requesting the update of a previous clients. 如果在排除概要之后多于一个概要被留下，则使用Tanimoto相似性关联来将当前请求装置概要与下述每个剩余客户机装置概要进行比较，所述每个剩余客户机装置与“property = value”三元组子集的分级列表全部匹配。  If more than one profile is left after the exclusion summary, using Tanimoto similarity correlation means schematic of the current request is compared with each of the remaining client device outline below, the client device and each of the remaining hierarchical list "property = value" triplets matching all subsets. 如果当被与当前请求概要进行比较时与“property = value”三元组子集的分级列表全部匹配的单个剩余装置概要低于预定的Tanimoto相似性系数阈值，则将该概要识别为在数据库中根据来自同一客户机装置的先前请求更新的当前请求客户机装置概要。 If a single remaining device profile when compared with the current request to the hierarchical summary list "property = value" subset of all triplets is below a predetermined match Tanimoto similarity coefficient threshold value, then the outline is identified in the database SUMMARY apparatus according to the current client requests from the same client device to update the previous request. 向发起客户机装置发送响应，与装置概要管理数据库中的客户机装置相关联的全球唯一标识符被嵌入在该响应中，并被返回给发起独一装置识别请求的移动装置浏览器。 Sending a response to the originating client device, with the globally unique identifier of the device profile management database associated with the client device is embedded in the response and returned to the mobile device browser originating the unique device identification request. 如果当被与当前请求概要进行比较时与“property =value”三元组子集的分级列表全部匹配的剩余客户机装置没有一个低于预定的Tanimoto相似性系数阈值，则将当前概要识别为来自独一客户机装置的第一次请求，并将当前概要作为新的装置概要保存在数据库中。 If, when compared with the current request schematic remaining client device hierarchical list "property = value" subset of all triplets no match is below a predefined Tanimoto similarity coefficient threshold, then the current profile is identified from the only a first client device a request, and the current profile as a new device profile stored in the database. 向发起客户机装置发送响应，与装置概要管理数据库中的客户机装置相关联的全球唯一标识符被嵌入在该响应中，并被返回给发起独一装置识别请求的移动装置浏览器。 Sending a response to the originating client device, with the globally unique identifier of the device profile management database associated with the client device is embedded in the response and returned to the mobile device browser originating the unique device identification request. 根据代替的实施方案，为被分配给输入移动装置浏览器请求的当前概要，检索存储在每个客户机装置概要中的所有“property = value”三元组子集的预配置分级列表，并检索现存于数据中的所有这样的客户机装置概要，这些客户机装置概要与当前请求概要中的预配置分级列表中的第一个最高权重“property = value”三元组的值匹配。  According to an embodiment of the place, it is assigned to the current profile for the input request for the mobile device browser, to retrieve a pre-configured hierarchical list stored in each client device profile all "property = value" a subset of triplets and retrieve all existing client device such outline data, the client device profile outline pre-configured hierarchical list in the first highest weight "property = value" triplet values ​​match with the current request. 独一装置概要管理系统420然后依次排除与列表中的每个“property = value”三元组不匹配的概要，直到一个概要被留下或者所有“property = value”三元组被使用为止。 Unique Device Profile Management System 420 then successively exclude each list "property = value" triplet profiles not matching until a profile is left or all "property = value" is used until the triplets. 其后，检索存在于数据库中的所有与当前请求概要的第一个“property = value”三元组的值匹配的客户机装置概要，并且独一装置概要管理系统420依次排除与列表中的每个“property = value”三元组不匹配的概要，直到一个概要被留下或者所有“property = value”三元组被使用为止。 Thereafter, the search exists in the database that matches the outline of all the values ​​of a "property = value" Summary of triplets current requesting client device, and the Unique Device Profile Management System 420 with each turn exclusion list a "property = value" triplet profiles not matching until a profile is left or all "property = value" is used until the triplets. 如果与子集“property = value”三元组的分级列表全部匹配的零个剩余客户机装置概要剩下，则将当前概要识别为来自独一装置的第一次请求，并将当前概要作为新的装置概要保存在数据库中。 Zero remaining client devices and if a schematic hierarchical list of a subset of "property = value" matching all triples left, then from the first current profile is identified as a unique means of a request, and the current profile as a new the device profile stored in the database. 向发起客户机装置发送响应，与装置概要管理数据库中的客户机装置相关联的全球唯一标识符被嵌入在该响应中，并被返回给发起独一装置识别请求的移动装置浏览器。 Sending a response to the originating client device, with the globally unique identifier of the device profile management database associated with the client device is embedded in the response and returned to the mobile device browser originating the unique device identification request. 图5A描绘图4中的独一装置概要管理系统420的简化框图500,并且图5B显示.NETweb.config内的独一装置识别系统概要属性部分。  FIG 5A depicts the unique device profile management system in a simplified block diagram of FIG. 4 500 420, and FIG. 5B shows a schematic section attributes unique device identification system within the .NETweb.config. 虽然可应用任何数量的服务器端数据存储技术，但是优选实施方案权衡将微软的.NET匿名概要分析系统作为实现独一装置概要存储的代理工具。  Although applicable to any number of server side data store technologies, but a preferred embodiment will weigh Microsoft's .NET Anonymous Profiling system as the implementation of the unique device profile stored proxy tool. 构建到.NET架构中的该系统存储持续串行化的强类型的每用户数据，并支持对认证用户和匿名用户二者的按需查找。 The storage system built into .NET architecture continued serialized strongly typed per-user data, and user authentication support for both on-demand and look for anonymous users. ASP.NET中的概要特征允许开发者使用如图5A中的文件510所表示的应用程序web.config文件来指定每用户设置或数据，该每用户设置或数据可被存储在匿名概要505中，以使得可检索设置，而无需用户登录到网站中。 SUMMARY feature in ASP.NET allows developers to use the application file in FIG. 5A web.config file 510 indicated to specify per-user settings or data, the per-user settings or data may be stored in an anonymous summary 505, so that the set can be retrieved without requiring the user to log in to the site. 微软创建提供程序(provider)模型，在该模型中，通过预安装的一个类或者一组类512提供概要分析服务。 Microsoft created provider (Provider) model, in this model, the service provided by the profiling of a pre-installed class or set of classes 512. 提供程序为具有被实现为满足子系统的需要的公知接口的类。 Provider to be implemented to meet the needs of having a well-known sub-class interface. 例如，概要提供程序为从.NET抽象“ProfilePixwider”类派生的类。 For example, the summary derived from the provider for .NET abstract "ProfilePixwider" Classes. 该类提供构成如块520所示的概要提供程序的接口的抽象方法和属性。 This class provides abstract methods and properties configuration interface 520 as shown in block schematic provider. 此外，该系统支持常规的数据库提供程序；然而，在本实施方案中使用标准默认提供程序，标准默认提供程序实现图5A中的微软SQL数据库服务器530本有的存储程序参数搜索能力。  In addition, the system supports a conventional database provider; however, in the present embodiment using standard default provider embodiment, the standard default provider implementation of Microsoft SQL Server Database 530 stores programs and some parameters search capability in Figure 5A. 关于实现微软的.NET匿名概要分析系统的细节存在于http://msdn.microsoft.com/en~us/library/ewfkf772.aspx。 Microsoft .NET on the realization of an anonymous summary of the details of the analysis system exists in http://msdn.microsoft.com/en~us/library/ewfkf772.aspx. 图5B显示用于指定装置概要属性名和默认值的.NET web.config内的实际概要属性部分。  Figure 5B shows a schematic apparatus actually summary attribute specified portion in .NET web.config property name and default values. 属性包括名称/类型对(name/type pair)，并将基本上变为规范，个人化数据将根据该规范存储。 Properties include the name / type pair (name / type pair), and becomes substantially standardized personal data will be stored according to the specification. 默认的是，概要属性仅用于认证用户。 The default is the summary attribute is only used to authenticate the user. 为了使得它们可用于匿名用户，将al1wAnonymous = “true”添加到属性中。 In order that they can be used for anonymous users, al1wAnonymous = "true" is added to the attribute. 没有该属性,如果当前用户是匿名的并且对该属性进行编写，则运行时间将抛出一个异常。 Without this attribute, if the current user is anonymous and write the attribute, the runtime will throw an exception. 使用〈properties〉元素内的〈add〉元素来定义属性° 可在http: //msdn.microsoft.com/en-us/library/system, web, profile,prof ilemigrateeventargs.anonymous id.aspx 找至丨J实现细节。 Use <properties> <add> element within the element to define the attributes may ° http: //msdn.microsoft.com/en-us/library/system, web, profile, prof ilemigrateeventargs.anonymous id.aspx to find Shu J implementation details. 图6描绘图5A上的独一装置识别概要管理程序502的处理操作的高级流程图，独一装置识别概要管理程序502由图5A中显示的独一装置概要管理系统420执行。  FIG 6 depicts a high level flowchart showing an outline of the management program 502 on the unique device identification processing operation in FIG. 5A, the unique device profile management system unique device identification profile management program 502 shown in FIG. 5A 420 performs. 当从图1B中表示的移动装置浏览器7接收到独一装置识别请求时，调用决定块650，决定块650测试移动装置浏览器7是否向独一装置管理系统发送全球唯一标识符“小甜饼”，该“小甜饼”是以前在以前的独一装置识别管理系统请求期间在装置中设置的。 When the mobile device browser represented in FIG. 1B 7 receives the unique device identification request, calling the decision block 650, decision block 650 tests whether the mobile device browser 7 transmits globally unique identifier "means a small sweet unique management system to cake ", the" cookie "is a period before the previous request unique device identification management system provided in the apparatus. 图1B所示的移动装置浏览器7自动在标准HTTP互联网协议“小甜饼”头中发送该“小甜饼”，如图4中的线401所示，在装置性能检测系统410接收标准HTTP互联网协议“小甜饼”头。 FIG mobile device browser shown in FIG. 1B 7 Auto "cookie" header in the transmission "cookies" in the standard HTTP Internet protocol, line 401 shown in FIG. 4, the apparatus 410 receives the standard HTTP Testing System Internet protocol "cookie" header. 沿着路径418将在标准HTTP协议头中接收的“小甜饼”信息传递到图4所示的独一装置概要管理系统420，在独一装置概要管理系统420中，该“小甜饼”信息被独一装置小甜饼测试块428执行。 418 will be received in the standard HTTP protocol header "cookie" information is passed along the path to the Unique Device Profile Management System 420 shown in FIG. 4, in the Unique Device Profile Management System 420, the "cookie." cookie information is independent apparatus 428 performs a test block. 在第一种情况下，如“是”路径651所示，执行处理块660，处理块660表示移动装置浏览器7支持“小甜饼”，并在以前执行过装置识别服务器请求，并且它将接收的⑶ID“小甜饼”拷贝到请求响应，并将生存时间延长6个月。  In the first case, as "YES" path 651, the execution processing block 660, processing block 660 indicates that the mobile device browser 7 supports "cookies", and the device recognition server request executed previously, and it received ⑶ID "cookie" copy request response and prolong survival time of 6 months. 它然后通过执行路径665调用处理块666,处理块666用于将客户机装置5重定向到驻存在服务器20上的独一装置识别管理系统400。 It then performs processing block 666 calls the path 665, the processing block 666 for 5 redirected to reside in the unique device identification management system 400 on server 20 the client device. 在第二种情况下，如“否”路径652所示，执行处理块650，处理块650表示装置移动装置浏览器7既不支持“小甜饼”，也不是来自支持“小甜饼”的客户机装置的第一次请求。  In the second case, such as the "No" path shown, the processing block 650, processing block 650 shows a device mobile device browser 7 supports neither "cookies" 652 nor support from "small sweet the first client device requesting cake "of. 块650产生新的⑶ID，并将新的⑶ID拷贝到被分配给独一装置识别管理系统400使用的命名的“小甜饼”头。 Block 650 generates a new ⑶ID, and copy the new ⑶ID named to be assigned to the unique device identification management system 400 uses a "cookie" header. 将值插入到请求响应中，并将其生存时间设置为多6个月。 The request value into the response, and the survival time was set for more than six months. 它然后通过路径655调用处理块666。 It then processing block 666 through a path 655 calls. 处理块666然后执行对独一装置识别管理系统400的互连网地址的.NET “Response.Redirect”系统调用，独一装置识别管理系统400驻存在图1B中显示的服务器20上。 Block 666 then performs the processing of the Internet address of .NET Unique Device Identification Management System 400 "Response.Redirect" system call, the Unique Device Identification Management System 400 residing in the server on the display 20 in FIG. 1B. 图7描绘由图4所示的独一装置概要管理系统420执行的处理操作700的高级流程图。  FIG. 7 depicts a high level flowchart of processing operations 700 performed 420 unique device profile management system shown in FIG. 4. 当进入到操作700中时，独一装置识别概要系统428执行其功能，操作700响应于由装置性能检测系统产生的、图4所示的装置概要管理事件(即，沿着路径418将来自装置性能检测系统410的请求发送到独一装置概要管理系统420)而发生。 When entering the operation 700, a unique device identification system 428 performs its function summary, the operation means 700 in response to generation by the performance of the detection system, device profile managing event shown in FIG. 4 (i.e., along a path 418 from the device performance Testing system 410 sends a request to the unique device Profile management system 420) occurs. 更具体地，独一识别概要系统428对独一装置识别概要搜索进行初始化。 More specifically, only a summary of the identification system 428 of his only a schematic device identification search is initialized. 这包括从HTTP协议头读取任何独一装置识别浏览器驻存“小甜饼”，该HTTP协议头是通过如图4中的事件401所示的独一装置识别请求接收的。 This includes reading any unique device identification browser from the HTTP protocol header reside "cookies", the HTTP protocol header by event 4 shown in FIG unique device identification request received 401. 虽然可应用任何数量的服务器端数据存储技术，但是公开这样的实现，该实现使用微软.NET匿名概要分析系统作为实现移动服务器独一装置识别管理系统存储的代理工具。  Although applicable to any number of server side data store technologies, but such implementation disclosed, implemented using the Microsoft .NET Anonymous Profiling system as the proxy server for mobile tool unique device identification management system storage. 构建到.NET架构中的该系统存储持续串行化的、强类型的每用户数据，并支持对认证用户和匿名用户二者的按需查找。 The storage system built into .NET architecture continued serialized, per-user data strongly typed and supports both on-demand and look for user authentication anonymous user. ASP.NET中的概要特征允许开发者指定每用户设置或数据，该每用户设置或数据可被存储在匿名概要中，以使得可在用户不登录的情况下检索设置。 SUMMARY feature in ASP.NET allows developers to specify per-user settings or data, the per-user settings or data may be stored in an anonymous summary, provided such can be retrieved without the user's login. 微软创建了提供程序模型，在该模型中，通过一个类或一组类提供概要分析服务。  Microsoft created provider model, in this model, to provide profiling services through a class or a group of classes. 提供程序为具有被实现为满足子系统的需要的公知接口的类。 Provider to be implemented to meet the needs of having a well-known sub-class interface. 例如，概要提供程序为从.NET抽象“ProfileProvider”类派生的类。 For example, the summary derived from the provider for .NET abstract "ProfileProvider" Classes. 该类提供构成概要提供程序的接口的抽象方法和属性。 This class provides abstract methods and properties schematic configuration provider interface. 此外，该系统支持可用于实现最佳的存储程序参数搜索性能的常规的数据库提供程序，所述存储程序参数搜索性能使得所述系统可随着积累越来越多的用户概要而改变大小。 In addition, the system supports can be used to achieve the best conventional database search performance parameters stored program provider, storing the program parameters such that the performance of the system may search with the accumulation of more and more the size of the user profile changes. 对于本实施方案，使用.NET架构中默认传递的标准提供程序。 For the present embodiment, using the .NET framework default standard delivery provider. 如前面所说明的，使用.NET ASP应用程序“Server.Transfer”功能将通过请求而接收的所有HTTP头透明地提供给独一装置概要管理系统420。  As previously explained, the application using .NET ASP "Server.Transfer" function request received by the HTTP header all transparently to the Unique Device Profile Management System 420. 内置的.NET功能可使得第二.asp程序(正接收传送的独一装置概要管理系统420)可获得关于由.NET应用程序(如图4所示的性能检测系统(或者独一装置识别概要系统428))接收的HTTP请求集合的所有当前内容。 The function can be built such that a second .asp .NET program (transmission being received Unique Device Profile Management System 420) obtained on the .NET application (shown in Figure 4 the performance of the detection system (or the unique device identification Summary system 428)) received HTTP request all current set of content. 一旦这发生，块750就对以前设置的用户识别管理系统“小甜饼”的接收进行测试。 Once this occurs, block 750 tests on the received user identification management system previously set "cookies" in. 如果接收到“小甜饼”，则决策块755通过“是”路径757将执行路由到决策块758。 If you receive a "cookie", then decision block 755 by the "Yes" path 757 will perform routing to decision block 758. 决策块758对以前设置的用户识别管理系统“小甜饼”的接收进行测试。  Decision block 758 tests the received user identification management system previously set "cookies" in. 如果接收到“小甜饼”，则决策块758对照当前的微软匿名概要名称(即，数据库概要的主键)来检查“小甜饼”值。 If you receive a "cookie", then decision block 758 against the current Microsoft anonymous profile name (ie, summary database primary key) to check the "cookie" value. 匹配表明特定请求装置的当前概要被所述.NET系统自动检索。 A match indicates that the current profile is a specific request means automatically retrieve the .NET system. 在这种情况下，决策块758通过“是”路径759将执行路由到块770。 In this case, decision block 758 to block 770 via "YES" path 759 to perform routing. 该块770用所有的当前装置识别值更新装置概要，然后将更新的概要与所述新的值一起保存到数据库中，所述装置识别值的实施例在后面的章节中描述。 The outline of the block 770 with all of the current device identification number updating means, and then the updated summary of the new value stored in the database along with the identification value of the apparatus embodiments described in a later section. 这些更新的值提供通过多个请求收集的、可用于随时间对行为进行监控的信息，所述信息比如被访问的网站的列表和包含在用户消费的内容页面中的上下文，例如对如图1B所示的第三服务器70做广告的传递上下文。 These updated values ​​collected by providing a plurality of requests, the information can be used to monitor the behavior over time, the list of information, such as access to the site is included in the user's context and content consumption page, for example, in FIG. 1B the third server 70 shown in the context of advertising delivery. 当结束时，块770通过执行路径771调用块772。  Upon completion, the block 770 through block 772 calls the execution path 771. 处理块772将HTTP响应配置到如图4中的事件401所示的发起独一装置识别请求，以将⑶ID “小甜饼”的移动装置浏览器生存时间值延长6个月。 HTTP response processing block 772 in FIG. 4 arranged to initiate an event unique device identification request 401 illustrated, to ⑶ID "cookies" in the mobile device browser to the survival time value period of six months. 具体地，如果客户机装置5支持编写和读取“小甜饼”，则当广告被服务时，本系统将来自该系统的GUID存储到“小甜饼”中。 Specifically, if the client device 5 supports read and write "cookies", then when the ad being served, the system stores the GUID from the system to the "cookie" in the. 如果客户机装置5支持“小甜饼”，则自动在具有任何以后的广告请求的HTTP “小甜饼”头中将“小甜饼”从客户机装置5发送到本系统。 If the client device 5 supports "cookies", automatically at any later HTTP having ad request "cookie" header in the "cookie" transmitted from the client device 5 to the system. 该“小甜饼”值是独一装置概要数据库430内的该装置概要的直接索引，并且因为通过用作概要主键的GUID “小甜饼”从数据库直接访问其相关联的概要，所以不需要在整个数据库中进行搜索以找到客户机装置的概要。 The value of this "cookie" is a direct index of the device within the outline of the unique device profile database 430, and because the outline by GUID as a primary key "cookie" its associated access profile directly from the database, it is not necessary search the entire database to find a summary of the client device. 在广告传递期间指定生存时间值，以延长先前存储的“小甜饼”有效寿命。 During the lifetime value specified ad delivery, to extend the previously stored "cookies" active life. 另外，从图4的独一装置概要数据库430中的装置概要读取⑶ID。  Further, the reading from the device profile ⑶ID unique device profile database 430 of FIG. 4. 另外，⑶ID值被附加到独一概要管理系统互联网地址URL的输入请求路径部分418，并执行对第三服务器70的互联网地址的.NET “Response.Redirect”系统调用。 In addition, ⑶ID value is appended to only a Profile Management System Internet URL address of the incoming request path section 418, and performs .NET Internet address of the third server 70 of the "Response.Redirect" system call. 在下述情况下，从图1B所示的所述特定客户机装置5接收第一次独一装置识别请求，所述情况即，如决策块755所示的支持“小甜饼”的装置执行“是”路径757，但是如决策块758所示，HTTP请求中不包含独一装置识别系统“小甜饼”，决策块758通过“否”路径760将执行路由到块765。  In a case where, as shown in FIG. 1B from the specific client device 5 receives the first time unique device identification request, i.e. the case where, as shown in decision block 755 to support "cookies" in means for performing "yES" path 757, but, as shown in decision block 758, HTTP request does not include a unique device identification system "cookies", decision block 758 routes execution to block 760 through 765 "no" path. 在这种情况下，微软的.NET匿名概要分析系统将临时概要分配给请求，并且块765处理将概要名称(即，其数据库主键)作为分配给独一装置的GUID保存。 In this case, the Microsoft .NET Anonymous Profiling system temporarily assigned to the requesting schematic, block 765 and the process profile name (i.e., its primary database key) as the GUID assigned to the unique device is stored. 当结束时，执行路径766调用块796。 Upon completion, block 796 calls the execution path 766. 块796负责用包含在在418由图4中显示的独一装置识别概要系统428接收的请求的发送中的所有装置识别值来更新当前的新的装置概要，然后将驻留的概要与装置鉴别值一起保存到数据库。 Summary and discriminating means comprising a block 796 is responsible for all the transmission device identification number unique device identification system shown in outline in Figure 4 by the 418,428 received request to update the current new device profile, and will reside value saved to the database together. 当结束时，块796通过执行路径797调用块772。  Upon completion, the block 796 through block 772 calls the execution path 797. 处理块772将HTTP响应配置到如图4中的事件401所示的发起独一装置识别请求，以将新概要GUID “小甜饼”的移动装置浏览器生存时间值设置为6个月。 HTTP response processing block 772 to the configuration shown in FIG. 4 initiated event 401 shown unique device identification request to the new profile GUID "cookies" in the mobile device browser to the survival time value is set to 6 months. 另外，从图4的数据库430中的装置概要读取⑶ID。 Further, from the reading apparatus ⑶ID schematic database 430 of FIG. 4. 该⑶ID值被附加到独一概要管理系统互联网地址URL的输入请求路径部分418，并执行对如图1B所示的第三服务器70的互联网地址的.NET “Response.Redirect”系统调用。 The .NET ⑶ID value is appended to only a Profile Management System Internet address URL request path input section 418, and performs as shown in FIG. 1B of the Internet address of the third server 70 "Response.Redirect" system call. 在如图1B所示的客户机装置5的发起移动装置浏览器7接收重定向响应。 Client device shown in FIG. 1B originating mobile device browser 7 receives the redirect response 5. 移动装置浏览器7中的标准HTTP协议处理例程对重定向响应进行解释，并发出对包含在HTTP协议重定向地址头中的重定向地址的请求，HTTP协议重定向地址头包含作为最后关键字(最后关键字=地址中的值对)的⑶ID或者作为查询字符的一部分，即，以下所示的URL的“ ？⑶ID =value”部分而传递的⑶ID。 The mobile device browser 7 of the standard HTTP protocol handler interprets the redirect response and issues a redirect address contained in the HTTP protocol redirect address header in the request, the HTTP protocol redirect address header containing the keyword as the last ⑶ID (keyword = value of the last address), or that is, URL query string as shown in the following part of "? ⑶ID = value" section and passed ⑶ID. 刚才所述的这种处理情况确保对独一装置识别管理系统400的下一个请求(包括GUID)被在相关联的浏览器“小甜饼”中与HTTP请求一起传递，所述下一个请求将使用自动微软匿名概要.NET系统自动检索客户机装置概要，无需搜索数据库找到概要。  This process according to the case just to ensure a unique device identification management system 400 next request (including GUID) is associated with the browser in the "cookie" passed along with the HTTP request, the lower a request will automatically use Microsoft anonymous SUMMARY automatically retrieve client device .NET system, without having to search the database to find the summary. 如前所述，决策块755测试如图1A所示的移动装置浏览器7是否支持设置“小甜饼”和将“小甜饼”发送到服务器。  As described above, the test of decision block 755 as shown in FIG mobile device browser supports disposed 1A 7 "cookies" and a "cookie" to the server. 在这种场景下，如“否”路径756所示，客户机装置5既不支持永久服务器浏览器“小甜饼”，也不被配置为允许永久服务器浏览器“小甜饼”。 In this scenario, such as the "No" path 756, the client device 5 supports neither permanent Server Browser "cookies", nor is configured to allow the browser to the server a permanent "cookies." 或者，载体的互联网网关可过滤掉装置浏览器“小甜饼”，以防止它们被设置或者被传递到互联网服务器。 Alternatively, the Internet gateway device may filter carrier browser "cookies" to prevent them from being set or is transferred to the Internet server. 在这些情况下，调用块780，块780表示“小甜饼”不能被独一装置识别管理系统400设置或读取。 In these cases, the call block 780, block 780 represents a "cookie" can not be the unique device identification management system 400 to set or read. 在这种情况下，通过来自如图1B所示的移动装置浏览器7的请求接收无“小甜饼”鉴别信息。 In this case, no reception "cookie" authentication information request from mobile device browser as shown in FIG. 1B 7 of the. 将该信息保存在由微软.NET匿名概要系统自动分配的临时概要中。 This information is stored in the temporary summary is automatically assigned by the Microsoft .NET Anonymous Profile system. 微软的.NET匿名概要系统没有设置移动装置浏览器7中的“小甜饼”的能力，每个请求将具有新分配的当前概要，块780将该新分配的当前概要与所有接收的装置信息一起保存。 Microsoft's .NET Anonymous Profile system is not provided with the mobile device browser capabilities "cookie" is 7, the current profile of each request with a new assignment, and all the received device information block 780 the new current profile assigned saved. 一旦块780处理结束，就将通过执行路径781将执行传送到块782，在块782中，获得新的概要属性，并对照在独一装置概要数据库430中维护的概要搜索当前概要属性值。  Once the block 780 processing ends 781 will transfer to block executed by the execution path 782, at block 782, to obtain a new profile attributes, and searches the control maintained in the outline unique device profile database 430 current profile properties value. 直到以前存储在独一装置识别管理系统概要数据库430中的任何一个存在概要被发现就鉴别信息而言与临时当前概要匹配，执行通过“否”路径787回送，直到所有鉴别单个参数被测试为止，列表包含在图5B中显示的.NET应用程序“web.config”文件中。 Until previously stored in the Unique Device Identification Management System summary database 430 any present summary is found on the authentication information in terms of the provisional current profile matching performed by the "No" path 787 loopback, until all the identifying single parameter to be tested, the list contains .NET applications shown in FIG. 5B "web.config" file. 并不是“web.config"文件中的每个参数都被用于执行匹配；相反，块782检索特定参数，以从到目前为止检索到的所有概要的当前子集中选择包含该参数值的所有概要。 Not "web.config" file for each parameter are executed to match; the contrary, the block 782 to retrieve specific parameters to retrieve from the current sub-date overview of all to choose the concentration of all profiles that contains the parameter value . 使用下一个参数(下一个参数=分级结构中的值)的每个搜索返回一些具有该匹配值的概要。 Case of using a parameter (parameter = value next hierarchy) each having the outline of some of the search returns matching values. 该过程重复，直到仅一个与该参数值匹配的概要从数据库430返回为止，或者直到所有鉴别值都已被处理并且在最终集合中剩下零个或者多于一个概要为止。 This process is repeated until only one profile and the parameter value until return from the database match 430, or until all values ​​have been processed discriminator and the remaining zero or more than a summary of the final set up. 这实现了这样一种折半方法，该方法排除非匹配概要，直到匹配被发现为止，或者我们可进行折半，直到我们可使用鉴别参数(鉴别参数=值)的分级结构为止。 This realizes a binary method, which exclude non-matching profiles until a match is found so far, we may be binary or until we can use the authentication parameter (authentication parameter = value) hierarchy. 决策块784测试当前的“web.config”参数(当前的“web.config”参数=在块782中用于根据前面的处理缩小当前概要子集的值)是否导致一个剩余概要。  Decision block 784 tests the current "web.config" parameter (current "web.config" parameter value of the current profile reduction = subset of the foregoing processing for block 782) is causing a remaining outline. 如果多于一个概要留下，则执行“否”决策路径785，决策路径785调用决策块786。 If more than one summary left, perform the "No" decision path 785, route 785 calls the decision a decision block 786. 块786测试用于对剩余概要子集进行折半处理的分级结构中的所有属性是否都被使用。 Block 786 tests for remaining subset outline whether all binary attribute hierarchy in the process are used. 如果还有要搜索的另外的属性，则下一个属性及其值被用作数据库搜索标准，通过执行“否”决策执行路径787从前次搜索返回先前的概要集的子集，对每个剩余鉴别符，重复处理环路(processing loop),直到所有鉴别符都被处理或者通过排除所有其他概要得到一个概要为止。 If there are additional attributes to be searched, then the next attribute and its value is used as the database search criteria, "NO" decision 787 returns a subset of the execution path previously set from the outline of the previous search by performing, for each of the remaining identification Fu, the processing loop is repeated (processing loop), until all have been processed discriminator or other profiles obtained by excluding a summary of all so far. 在搜索包含下一个鉴别符参数(下一个鉴别符参数=值)的先前的概要子集之后一个概要留下的情况下，发现以前为以前执行过独一装置识别管理系统请求的客户机装置而保存的概要。 After the case where the previous outline of the subset  Searching for a discriminator parameter comprise the (next = discriminator parameter value) is a schematic left, as found previously executed before the client unique device identification management system request Summary machine saved device. 这种情况以下述方式表示，即，决策块784执行“是”执行路径794，以调用块794。 This is shown in such a manner, i.e., decision block 784 performs "Yes" execution path 794, to block 794 calls. 块794的处理用与当前请求客户机装置5对应的以前的概要代替由微软的.NET匿名概要系统自动分配给每一个新的用户请求的临时概要。 Processing block 794 with the previous summary of the current request corresponding to the client device 5 instead of temporary outline assigned automatically by Microsoft .NET Anonymous Profile system to every new user request. 当刚才所述的块794的处理结束时，通过执行路径795执行块796。  When the just described processing block 794 is performed by the execution path 795 796. 前面已论述了块796对当前概要执行的处理，当前概要现在是以前在以前的请求期间存储在数据库430中的装置概要，该处理与当对来自支持浏览器“小甜饼”的客户机装置5的第一次装置请求从块765通过执行路径766调用块796时所述的处理相同。 Previously discussed block 796 processing of the current summary execution, now is a summary of the current profile previously stored during previous requests in the database apparatus 430, the process and when the client from a browser that supports "cookies" means first means 5 of the same request by the execution path 765 from block 796 of the processing block 766 calls. 在下述情况下，决策块786执行“是”执行路径788以调用处理块789，所述情况即，“web.config”文件中的所有鉴别装置属性都已被用于对与以前的装置鉴别信息匹配的概要的剩余子集进行折半处理，并且多于一个概要从以前的集合留下。  In the following cases, the implementation of decision block 786, "yes" path 788 to perform call processing block 789, i.e., the case, "Web.config" means all the identifying attribute file have been used for the previous the remaining subset of the outline of the apparatus authentication information matches the binary processing is performed, and more than one profile left from the previous set. 块789执行公知的、普遍使用的相似性关联技术，该技术已知为Tanimoto相似性测试。 Block 789 performs well-known, the similarity of the related art generally used, the technique is known as the Tanimoto similarity test. Tanimoto系数(扩展的Jaccard系数)余弦相似性是两个η维矢量之间的相似性度量，该度量找到这两个矢量之间的角度。 Cosine similarity Tanimoto coefficient (extended Jaccard coefficient) is a similarity measure between the two η-dimensional vector, the measure to find the angle between two vectors. 给定两个属性矢量A和B，使用点积和大小表示余弦相似性Θ。 Given two attribute vectors A and B, and the size of the dot product indicates cosine similarity Θ. Tanimoto技术的优点是不同长度矢量的概要可被直接比较，相似性关联可被计算。 Tanimoto technique advantage is a schematic of different lengths can be directly compared vector, similarity relationships may be calculated. Tanimoto使得独一识别管理系统可考虑不同请求的不同的鉴别值以及下述这些值，这些值不执行和以高确定性执行来自装置的输入概要与其来自先前的独一装置识别请求的过去概要的模糊匹配。 Tanimoto unique identification management system that can take into account different values ​​for different authentication request and below these values, these values ​​are not performed in the past and the preceding summary unique device identification performed at high certainty from the input means thereto summary request from fuzzy matching. 由于算法本身在许多学科被很好地使用并且已有很多文献，所以将不对它进行进一步的论述。 Since the algorithm itself is well used in many disciplines and has been well documented, so it will not be further discussed. 由微软的.NET匿名概要系统自动分配的当前临时概要具有其Tanimoto相似性系数，该系数通过对照前面描述的对分级结构中的最后概要属性进行折半处理结束时数据库中剩余的每个剩余概要计算得到。 SUMMARY current temporary assigned automatically by Microsoft .NET Anonymous Profile system has its Tanimoto similarity coefficient, the coefficient for the last hierarchy attributes schematic outline of each of the remaining residual calculation database and processed by the front end of a binary control described get. 如前所述，不是所有的装置属性都被用于执行与所用的参数值的列表匹配的概要子集的这种向下折半处理。 This summary of the subset as described above, not all devices are used to match the list of attributes is performed with the parameter values ​​of the binary down process. 当块789的处理结束时，通过执行路径701调用决策块791的执行。 When the process block 789, the call by the execution path 701 to decision block 791 is executed. 为了确定以前保存在数据库430中的概要和当前请求客户机装置5之间的相似性匹配，在独一装置识别管理系统400中使用凭经验得到的可配置阈值。  In order to determine the profile to previously stored in the database 430 and similarity matching between the current request the client device 5, using the configurable threshold empirically obtained in the Unique Device Identification Management System 400. 如果一个或更多个概要被确定低于Tanimoto阈值，则认为具有最低相似性系数的概要是与当前请求装置的匹配。 If one or more is determined to be below the Tanimoto schematic threshold, summary is considered having the lowest similarity coefficient is matching means with the current request. 如果发现最低概要低于相似性阈值，则决策块791执行“是”决策路径793，以调用块794。 If you find a summary below the minimum similarity threshold, then decision block 791 to perform "yes" decision path 793 to block 794 calls. 块794的处理用与当前请求客户机装置5对应的以前的前概要代替由微软的.NET匿名概要系统自动分配给每一个新的用户请求的临时概要。 Processing block 794 with the current request before the previous client device 5 instead of temporary outline corresponding to an outline assigned automatically by Microsoft .NET Anonymous Profile system to every new user request. 当刚才所述的块794的处理结束时，通过执行路径795执行块796。 When the just described process block 794, executed by the execution path 795 796. 前面已论述了对当前概要执行的处理，当前概要现在是以前在以前的请求期间存储在数据库430中的装置概要，该处理与当对于来自支持浏览器“小甜饼”的装置的第一次装置请求从块765通过执行路径766调用块796时所述的操作相同。 Previously discussed processing of the current summary execution, now is a summary of the current profile previously stored during previous requests in the database apparatus 430, when the processing for the first device from a supported browser "cookies" in the first apparatus 765 requests the same operation block 796 from the block 766 by executing the call path. 如前所述，决策块791测试在块789处理结束之后剩余的一个或更多个概要是否被确定为低于前面论述的Tanimoto相似性阈值。  As described above, the test in decision block 791 after the process block 789 the remaining one or more of whether the outline is determined to be below the Tanimoto similarity threshold previously discussed. 如果没有概要落在该凭经验得到的阈值之下，则通过“否”路径792执行块765，块765表示从图1B中显示的客户机装置5接收到第一次独一装置识别请求。 If there is no summary falls below the threshold value obtained empirically, through the "No" path 792 performs block 765, block 765 represents the client device 5 shown in FIG. 1B from the received first unique device identification request. 在这种情况下，微软的.NET匿名概要分析系统将临时概要分配给请求，并且块765处理将将概要名称(B卩，其数据库主键)作为被分配给独一装置的GUID保存。 In this case, the Microsoft .NET Anonymous Profiling system to request the temporary assignment outline, and the processing block 765 the profile name (B Jie, its database primary key) as the GUID assigned to the unique device is stored. 当结束时，通过执行路径766调用块796。 When the end of the path 766 by executing the block 796 calls. 块796负责用包含在418由图4中显示的块428接收的请求的发送中的所有装置识别值更新当前的新装置概要，然后将驻留的概要与装置鉴别值一起保存到数据库，所述装置识别值的实施例在后面的章节中描述。 Block 796 is responsible for all of the devices identified by the value contained in the transmission request received by the block 428,418 shown in FIG. 4 schematic new update the current device and the outline will reside with the authentification value stored in the database together with the device, the Example device identification number described in a later section. 以下列表表示可构成在.NET应用程序的“web.config”配置文件内指定的唯一识别用户概要的属性子集。  The following list represents the configuration in the "web.config" .NET application profile attributes identifying a subset of user profiles only designated. .NET概要分析系统自动允许动态添加新属性，而不会由于对象相关模型重叠而影响保存在存在的用户概要记录中的数据。 .NET allows dynamic profiling system automatically add new properties, but will not affect the data stored in the user profile records occurring due to overlapping correlation model objects. 记载的属性子集为当被选择为实现平台时适合于活动管理系统的属性。 Subset of the attributes described is selected to achieve when the platform is adapted to the properties of the activity management system. 这是独一装置概要最后被访问的日期。  This is a unique device profile date last accessed. 这是当新记录被创建时由.NET架构分配给表入口的全球唯一ID (即，新记录的主键)，它被用作装置识别“小甜饼”值，该值用于映射到后面的广告请求的用户数据库入口。  This is when the new record global unique ID (i.e., a new record of the primary key) assigned to a table entry of the .NET framework, which is used as the device identification is created when the "cookie" value for mapping ad request to the back of a user database entry. “Cookie 或者⑶ID Cookie”  "Cookie or ⑶ID Cookie"
 这是特设的独一装置识别“小甜饼”值，在验证终端装置支持“小甜饼”之前第一次设置该值时将该值初始化为零。  This is a unique device identification ad hoc "cookie" value, when the verification terminal apparatus supports "cookies" the first set value before the value is initialized to zero. 如果支持“小甜饼”，则将用以上“Name”属性设置该值，作为区分第一次访客与数据库中已存在的先前访客。 If you support the "cookies", then set the value by more than "Name" attribute, as a first time visitor to distinguish the database already exists in the previous visitors. 应该意识到，虽然“小甜饼”根据本发明实现，但是无论客户机装置是否支持“小甜饼”，本发明在所有情况下都可对客户机装置进行独一识别。 It should be realized that although the "cookies" According to the invention, but regardless of the client device supports "cookies", the present invention can be carried out only on a client device identification in all cases. 不是所有的客户机装置都支持“小甜饼”，比如，根据我们对过去活动的分析，少于50%的装置支持“小甜饼”。 Not all client devices support "cookies", for example, based on our analysis of past activities, less than 50% of device support "cookies." 从可扩展性和性能的观点，对于支持“小甜饼”的那些客户机装置，不需要数据库搜索，相反，“小甜饼”变为装置概要的直接索引，所以如果本系统能设置和读取客户机装置中的“小甜饼”，则我们应当利用该事实，但是对于不支持“小甜饼”的那些客户机装置，我们使用我们在数据库里搜索装置的先前概要的其他鉴别符。 From the viewpoint of scalability and performance, support for "cookies" to those client devices do not need to search databases, on the contrary, "cookies" to direct the device profile index, so if the system can be set and read take the client device "cookies", then we should take advantage of that fact, but for those client devices do not support "cookies", we use other discriminator summary of our previous database search device. 如果某人清除他们的“小甜饼”，则我们仍然可使用所有的所述其他鉴别符识别装置。 If someone clear their "cookies", we still can identify all of the other character recognition devices. 这是全球唯一装置标识符的分配值，该值用于唯一地识别先前的请求装置。  This is a unique device identifier assigned to the global value, this value is used to uniquely identify a previous request means. 它被作为到供它使用的外部系统的重定向的一部分发送到用户装置，它通常应该与装置概要中的“Name”值匹配，所述外部系统比如跟踪访问人次(uniques)和执行关于向特定用户呈现特定广告的次数的频率限额的广告管理系统。 As it is redirected to a portion of the external system used for its transmission to the user device, which is generally a schematic of the device should match the "Name", the track access to external systems, such as passengers (uniques) and a specific implementation of the frequency limit of the number of users presenting a particular ad management systems. 这是来自对独一装置识别管理系统的请求的SITE = VALUE对。 SITE  It is to request from the unique device identification management system = VALUE pair. 在操作中分配该值，以识别为了分析报告和账单的目的与其订立合同的发行者。 In operation, the value assigned to identify the issuer for analytical purposes of reporting, and billing of its contract. 该特定属性可被用于鉴别浏览网络中的不同网站的相似用户。 This particular property can be used to identify similar users browse the network in different sites. “HTTPHeaders”  "HTTPHeaders"
 这是从装置发送到.NET独一装置识别管理应用程序的HTTP头的完整集合。  It is transmitted from the device to the complete set of .NET HTTP header unique device identification management application. 它包含可根据装置而改变的数据，该数据被解析，以提供用于区分装置类型内的用户和跨装置类型的用户的细粒(fine grain)鉴别符。 It contains the data may be changed according to the device, the data is parsed to provide a discriminator for the user and the user types in the cross-device type distinguishing means fines (fine grain). 例如,包括支持的mime类型和例如ECMAScript支持的性能。 For example, supports mime type and including e.g. ECMAScript support performance. 这是终端用户装置从其展现请求的发行者内容页面的URL地址。  This is the URL address of the end-user device from the publisher to show the contents of the page request. 终端用户装置将它作为HTTP属性之一发送到独一装置识别管理概要分析系统，它包含执行独一装置识别请求的原始推荐链接页面。 End-user device to send it as a unique one of the HTTP attributes profiling device identification management system, which comprises performing the original page links to the unique device identification request. 这是终端用户装置的原始IP地址。  This is the original IP address of the end user device. IP地址的DHCP动态分配得到这个不可用作主机地址的鉴别参数，除了在单个会话内之外。 DHCP dynamic allocation of IP addresses that are not useful to obtain a host address identification parameters, in addition to a single session. 然而，该地址的网络前部分可被用于作为鉴别符参数提供载体IP范围内的网络，用户从该网络进入。 However, the front portion of the network address can be used as a discriminator parameter provides the network support IP range, the user enters from the network. 该值从在请求url内发送的服务器端包含变量QUERYSTRING%%返回。  This value is transmitted from the server in a request url comprising a variable return QUERYSTRING %%. 它提供发行者引擎工具，发行者引擎被嵌入在广告请求数据路径中以附加唯一识别参数，这些参数然后可被概要分析系统用于识别发行者特定的内容跟踪属性。 It provides tools engine issuer, the issuer engine is embedded in the ad request additional data path to uniquely identify parameters which can then be used to identify the profiling system issuer-specific content property tracking. 这是从展现装置识别请求标签的终端用户装置发出的请求的日期和时间。  This is the date and time of the end user device requesting a device recognition request sent from a tag to show. 该值从服务器端包含变量％ % DATETIM`E % %返回，服务器端包含变量％ % DATETIME % %在到装置识别概要管理应用程序的请求url内接收。 The value contains variable%% DATETIM`E%% returned from the server, the server comprising variable%% DATETIME%% received a request url to the device identification profile management application. 这是发送给独一装置识别管理系统的实际请求的URL地址，该地址从请求URL服务器端包含变量％ % REQUEST % %返回，请求URL服务器端包含变量％ % REQUEST % %由终端用户装置在请求URL中发送。  This URL is sent to the address of the actual request unique device identification management system request to the URL address from the server side include variable%% REQUEST%% return, the server request URL contains the variable%% REQUEST%% by the end user means for sending the request URL. 这是当独一装置识别管理系统从终端用户装置接收到请求时它所接收的HTTP代理字符串。  It is only when a character string HTTP proxy device identification management system request is received from the end user device to which it is received. 该值从服务器应用程序包含变量％ % AGENT % %返回。 The value contains variable%% AGENT%% returned from the server application. 这是C0NTEXT1 =包含在如果使用就发送的实际请求的URL地址中的值参数，该值参数从服务器端包含变量REQUESTS %返回。  It is C0NTEXT1 = parameter values ​​contained in the URL to use if the actual request sent in, the parameter contains the value of the variable returns from the server REQUESTS%. 上下文提取系统在到独一装置识别管理应用程序的请求url中发送该值，从该值得到C0NTEXT1。 Context extraction system sends the request to the url value unique device identification management application, it is worth to from the C0NTEXT1. 这是由上下文提取引擎确定的文本上下文，该文本上下文被附加到被作为精准定向参数而传递的装置请求。 This text is extracted by the context determined context engine, it is attached to the device request to be passed as a parameter of the precise orientation of the text context. 这是C0NTEXT2 =包含在如果使用就发送的实际请求的URL地址中的值参数，该值参数从服务器端包含变量REQUESTS %返回。  It is C0NTEXT2 = parameter values ​​contained in the URL to use if the actual request sent in, the parameter contains the value of the variable returns from the server REQUESTS%. 上下文提取系统在到独一装置识别管理应用程序的请求url中发送该值，从该值得到C0NTEXT1。 Context extraction system sends the request to the url value unique device identification management application, it is worth to from the C0NTEXT1. 这是由上下文提取引擎确定的文本上下文，该文本上下文被附加到被作为精准定向参数而传递的装置请求。 This text is extracted by the context determined context engine, it is attached to the device request to be passed as a parameter of the precise orientation of the text context. “AppC0NTEXT3” 这是C0NTEXT1 =包含在如果使用就发送的实际请求的URL地址中的值参数，该值参数从服务器端包含变量REQUESTS %返回。  "AppC0NTEXT3"  This is the value of the parameter C0NTEXT1 = If the URL address included in the request sent to the actual, which contains a variable value of the parameter from the server returns REQUESTS%. 上下文提取系统在到独一装置识别管理应用程序的请求url中发送该值，从该值得到C0NTEXT1。 Context extraction system sends the request to the url value unique device identification management application, it is worth to from the C0NTEXT1. 这是由上下文提取引擎确定的文本上下文，该文本上下文被附加到被作为精准定向参数而传递的装置请求。 This text is extracted by the context determined context engine, it is attached to the device request to be passed as a parameter of the precise orientation of the text context. 这是CARRIER =由独一装置识别管理系统基于从装置发送的实际请求的请求URL地址中的网络IP地址而确定的值参数。  This is the value of the parameter CARRIER = request URL address of the actual request sent from the IP address of the network device is determined by the unique device identification management system. 这是DEVICE =由独一装置识别管理系统确定的参数。  DEVICE = parameter which is determined by the unique device identification management system. 该值从代理HTTP头确定，代理HTTP头被在重定向url内从提供给独一装置识别概要管理应用程序的WURFL装置性能检测系统发送，所述代理HTTP头中的DEVICE部分被提取为执行从发行者网站请求的始发请求的移动装置类型。 This value is determined from the HTTP proxy header, a proxy is HTTP header in the redirect url from within to provide the unique device identification profile management application WURFL transmitting device capabilities detection system, the header of the HTTP proxy DEVICE is extracted as executed from the type of mobile device originating the request of the issuer's Web site request. 这是SCRNWIDTH =由独一装置识别管理系统确定的值参数。  It is SCRNWIDTH = value of the parameter determined by the unique device identification management system. 该值从屏幕宽度规范确定，屏幕宽度规范被在重定向url内从提供给独一装置识别概要管理应用程序的WURFL装置性能检测系统发送，所述屏幕宽度规范中的SCRNWIDTH部分被提取为执行从发行者网站请求的始发请求的移动装置类型。 This value is determined from the screen width specification, the screen width specification is in the redirect url from within to provide the unique device identification profile management application WURFL transmission device capabilities detection system, SCRNWIDTH portion of the screen width specification is performed is extracted from the type of mobile device originating the request of the issuer's Web site request. 这是SCRNHEIGHT =由独一装置识别管理系统确定的值参数。  It is SCRNHEIGHT = value of the parameter determined by the unique device identification management system. 该值从屏幕宽度规范确定，屏幕宽度规范被在重定向url内从提供给独一装置识别概要管理应用程序的WURFL装置性能检测系统发送，所述屏幕宽度规范中的SCRNHEIGHT部分被提取为执行从发行者网站请求的始发请求的移动装置类型。 This value is determined from the screen width specification, the screen width specification is in the redirect url from within to provide the unique device identification profile management application WURFL transmission device capabilities detection system, SCRNHEIGHT portion of the screen width specification is performed is extracted from the type of mobile device originating the request of the issuer's Web site request. 跟踪路由程序被作为捕获互联网路由器的异步过程执行，通过互联网路由器，用户移动装置主机IP包行进在它们到用户概要分析系统的路上。  traceroute Internet routers are captured as asynchronous execution, via the Internet router, a mobile device user host IP packet travel path thereof to a user profile analysis system. ICMP协议被用于PING，并使用增加的生存时间来确定路径上的每个路由器。 ICMP protocol is used for PING, and use the increased survival time to determine each router on the path. 该TCP/IP消息触发来自构成互联网路径的每个路由器的响应，链中的最后一个路由器返回路径结束消息。 The TCP / IP message router configured to trigger a response from each of the Internet path, the last router in the chain return path completion message. 即使路由器可随整个互联网中的每个连接点改变，最靠近用户装置的网关多半保持一致，并且如果需要区分用户，则最靠近用户装置的网关可被用作用户概要中的最终鉴别参数。 Even if the route can be connected with each change point across the Internet, the gateway closest to the user device is most consistent, and if necessary to distinguish the user, the gateway closest to the user device may be used as the final authentication parameter in the user profile. 本领域的任何技术人员将认识到以上仅列出了可用在本发明中的装置子集、网络互联网网关和独一用户识别管理服务器属性。  anyone skilled in the art will recognize that the above lists only a subset of available devices in the present invention, the network gateway and Internet unique user identification management server properties. 可利用的更多，但是仅提供了以上代表性实施例，以使本专利的长度最小。 More available, but only provides the above representative embodiments, to minimize the length of this patent. 随着技术改变和移动网络所有者修改他们的协议以涵盖新服务，另外的参数可供独一装置识别鉴别性能利用。  As technology changes and modifications of their mobile network owner protocol to cover new services, additional parameters are available only discrimination performance using device identification. 另外，本文档中所述的参数中的一些将不再相关，可从用户概要删除。 Further, according to this document a number of parameters will no longer be relevant, the user may be deleted from the outline. 前述公开内容显示本发明在没有在传递给终端用户之前将特定广告HTML文件请求嵌入在发行者系统处的网页内的情况下操作。  The foregoing disclosure shows the invention prior to being passed on to the end user without the specific ad embedding HTML file request in a case where the page at the issuer system. 另外，本发明提供在无线网络外部执行的、跨用户会话反复出现的移动互联网匿名装置识别，所述移动互联网匿名装置识别使得可适应目前为非移动互联网标准化的在线广告性能和结算方法。 Further, the present invention provides, the mobile device identification anonymous user sessions across the Internet recurring performed outside the wireless network, the mobile device identification anonymous Internet makes it possible to adapt to the current non-mobile Internet standardization online advertising performance and billing methods. 因此，就实现与在线广告中的浏览器“小甜饼”相关联的相同的性能而言，本系统在节省劳力、时间和成本方面对移动刊登广告者和移动发行者提供了相当大的节省。  Accordingly, to achieve the same performance in terms of browser "cookies" associated with online advertising, the system in saving labor, time and cost of mobile advertising and mobile publishers who provided considerable big savings. 另外，本系统以下述方式工作，所述方式对用户基本上(如果不是完全的话)是透明的，既没有给该用户或者内容发行者带来不便，也没有给该用户或者内容发行者带来负担。 Further, the system operates in the following manner, the way the user is substantially (if not complete it) is transparent, neither inconvenience to the user or the content issuer, the user does not bring the content issuer or burden. 本系统不要求发行者，也不要求用户在他的或她的内容管理系统或移动装置上下载和安装分离的应用程序，更不用说对该应用程序的任何更新，具体地，发送或接收在线广告，或者执行除了正常的互联网内容传递和浏览之外的用于接收这样的广告的任何确认行为。 This system does not require the issuer and does not require users to download and install a separate application on his or her content management system or a mobile device, let alone any updates to the application, in particular, to send or receive online advertising, or perform in addition to the normal Internet browsing and content delivery to any affirmative act to receive such advertising. 此外，本系统是平台无关的，通过这样做，本系统在基本上任何移动装置上用基本上任何移动装置浏览器操作。 Further, the present system is a platform-independent, by doing so, the present system on a mobile device with substantially any substantially any mobile device browser operation. 最后，本系统通过精确地、有效地弄清完整展现的移动广告的用户展示次数来向广告商提供正确的结算，以及提供对使移动用户接触广告的次数进行频率限定，另外捕获到移动发行者的网站的独一访客的数量。 Finally, the system is provided by a user impressions accurately, efficiently ascertain the complete mobile ad show the correct billing advertisers, and to provide the number of times the user touches the mobile ad defined frequency, in addition to the mobile capture issuer the number of unique visitors to the site. 最后，本系统提供新的匿名独一装置识别系统，该系统将有效地实现广告商的广泛支持和使用以及移动互联网用户的接受，从而导致移动广告的使用总体上大量扩大。  Finally, the system provides a new anonymous unique device identification system that will effectively achieve broad support and use of mobile Internet users accept advertising business, resulting in a large number of the general expansion of the use of mobile advertising. 虽然已显示了并入本发明的教导的一种实施方案，并且这里对该实施方案进行了相当详细的描述，但是本领域技术人员可易于想出仍然利用这些教导的本发明的许多其他实施方案和应用。  Although embodiments have been shown an embodiment incorporating the teachings of the present invention, and are described herein in considerable detail to the embodiments, those skilled in the art can readily come up with still utilize these teachings of the present invention, many other embodiments and applications. 1.一种用于实现在联网客户机-服务器环境下唯一地识别网络分布式装置的匿名的且对用户透明的技术的系统，所述系统包括: 内容服务器，所述内容服务器通过全球通讯网络连接至客户机装置，并且所述内容服务器包括第一软件模块和内容服务器处理器，所述第一软件模块引导所述内容服务器处理器将内容页面从所述内容服务器发送到所述客户机装置，所述内容页面具有表示页面内容的多个计算机可读指令和用于在所述客户机装置上下载和执行脚本的嵌入代码； 脚本服务器，所述脚本服务器通过所述全球通讯网络连接至所述客户机装置，并且所述脚本服务器包括第二软件模块和脚本服务器处理器，所述第二软件模块引导所述脚本服务器处理器将所述脚本发送到所述客户机装置，所述脚本被配置用于将独一装置识别请求透明地插入所述内容页面； 独 1. A method for implementing in a networked client - server environment uniquely identifying network-distributed devices anonymous and transparent to the user of the technology, the system comprising: a content server through a global communication network, the content server connected to the client device and the content server comprises a first processor and a content server software module, the first software module directs the processor to content page server content transmitted from the content server to the client device a plurality of computers, a page having the content page content represented readable instructions and codes for embedding in the client device and the execution of scripts; server script, the script by the server connected to the global communication network said client device, and said second software module comprises a script and server script server processor, the second software module directs the script to the server processor transmits the script to the client device, the script is configured for unique device identification request transparently inserted into the content page; alone 一装置识别管理系统，所述独一装置识别管理系统通过所述全球通讯网络与所述客户机装置进行通信，并且所述独一装置识别管理系统包括第三软件模块和第三处理器，所述第三软件模块引导所述第三处理器来: 从所述客户机装置接收独一装置识别数据，其中所述独一装置识别数据不包括浏览器端“小甜饼”， 选择与所述客户机装置相关联的全球唯一标识符，以及将所述全球唯一标识符保存在所述独一装置识别管理系统的数据库中；以及独一装置概要管理系统，所述独一装置概要管理系统与所述独一装置识别管理系统进行通信，并且所述独一装置概要管理系统包括第四软件模块和第四处理器，所述第四软件模块引导所述第四处理器检索存在于所述独一装置概要管理系统的概要数据库中的装置概要，用于与所述客户机装置的概要进行比较， 其中所述 A device identification management system, a unique device identification management system via said global communication network and said client device communicates, and the unique device identification management system comprises a third processor and a third software module, the said third software module to guide the third processor to: receive from the client device a unique device identification data, wherein the unique device identification data does not include a browser "cookie", to select the globally unique identifier associated with the client device, the globally unique identifier and stored in a database of the unique device identification management system; and the unique device profile management system, a unique device profile management system the unique device identification management system in communication, and the unique device profile management system includes a fourth processor and a fourth software module, the software module directs the fourth fourth processor retrieves only present in the SUMMARY device profile management database means a system for comparing with the profile of the client device, wherein the 独一装置识别管理系统包括装置性能数据库系统，所述装置性能数据库系统将所选择的装置性能附加到从所述客`户机装置的装置浏览器接收的输入互联网地址URL，并将所述请求重定向到所述独一装置概要管理系统； 其中所述独一装置概要管理系统检索所述客户机装置的概要，检索存在于所述概要数据库中的所有装置概要，并依次排除不匹配的概要，直到单个概要被留下或者所有概要都已被使用为止，如果单个概要被留下，则将该概要识别为当前请求客户机装置，并在所述概要数据库中根据来自同一客户机装置的以前的请求对所述概要进行更新。 A unique device identification management system comprises a device capabilities database system, the database system performance of the device performance of the device attached to the input of the selected Internet address URL received from the device browser of the client device off 'and the request redirected to the unique device profile management system; wherein the unique device profile outline management system retrieves the client device, retrieves all the summary is present in the device profile database, and sequentially eliminates profiles not matching until a single profile is left or all profiles have been used so far, if a single profile is left, then the outline is identified as the current requesting client device, and in accordance with the previous summary database from the same client device the request to update the summary. 2.如权利要求1所述的系统，其中所述装置浏览器为移动装置浏览器。 2. The system according to claim 1, wherein said apparatus is a mobile device browser to browser. 3.如权利要求1所述的系统，其中所述脚本由所述脚本服务器动态产生。 The system according to claim 1, wherein said script server dynamically generated by the script. 4.如权利要求1所述的系统，其中所述独一装置概要管理系统为微软的.NET匿名用户概要系统。 4. The system according to claim 1, wherein the unique device profile management system is a Microsoft .NET anonymous user profile system. 5.一种用于实现在联网客户机-服务器环境下唯一地识别网络分布式装置的匿名的且对用户透明的技术的系统，所述系统包括: 内容服务器，所述内容服务器通过全球通讯网络连接至客户机装置，并且所述内容服务器包括第一软件模块和内容服务器处理器，所述第一软件模块弓丨导所述内容服务器处理器将内容页面从所述内容服务器发送到所述客户机装置，所述内容页面具有表示页面内容的多个计算机可读指令和用于在所述客户机装置上下载和执行脚本的嵌入代码； 脚本服务器，所述脚本服务器通过所述全球通讯网络连接至所述客户机装置，并且所述脚本服务器包括第二软件模块和脚本服务器处理器，所述第二软件模块引导所述脚本服务器处理器将所述脚本发送到所述客户机装置，所述脚本被配置用于将独一装置识别请求透明地插入所述内容页面； A machine for implementing in a networked client - server environment uniquely identifying network-distributed devices anonymous and transparent to the user of the technology, the system comprising: a content server through a global communication network, the content server connected to the client device and the content server comprises a first processor and a content server software module, the first software module guide arch Shu the content page content server processor to transmit content from the server to the client machine means having a plurality of the content page code is embedded computer-readable instructions for downloading on the client device and the execution of the script showing the content of the page; server script, the script server via said global communication network to the client device, and said second software module comprises a script and server script server processor, the second software module directs the script to the server processor transmits the script to the client device, said script is configured for unique device identification request transparently inserted into the content page; 独一装置识别管理系统，所述独一装置识别管理系统通过所述全球通讯网络与所述客户机装置进行通信，并且所述独一装置识别管理系统包括第三软件模块和第三处理器，所述第三软件模块引导所述第三处理器来: 从所述客户机装置接收独一装置识别数据，其中所述独一装置识别数据不包括浏览器端“小甜饼”， 选择与所述客户机装置相关联的全球唯一标识符，以及将所述全球唯一标识符保存在所述独一装置识别管理系统的数据库中；以及独一装置概要管理系统，所述独一装置概要管理系统与所述独一装置识别管理系统进行通信，并且所述独一装置概要管理系统包括第四软件模块和第四处理器，所述第四软件模块引导所述第四处理器检索存在于所述独一装置概要管理系统的概要数据库中的装置概要，用于与所述客户机装置的概要进行比较， 其中所 A unique device identification management system, a unique device identification management system via said global communication network and said client device communicates, and the unique device identification management system comprises a third processor and a third software module, the third software module to guide the third processor to: receive a unique device identification data from the client device, wherein the unique device identification data does not include a browser "cookies", and select the said globally unique identifier associated with the client device, the globally unique identifier and stored in a database of the unique device identification management system; and the unique device profile management system, a unique device profile management system with the unique device identification management system in communication, and the unique device profile management system includes a fourth processor and a fourth software module, the software module fourth processor retrieves the fourth guide in the present SUMMARY database device unique device profile management system is for comparison with the profile of the client device, wherein 述独一装置识别管理系统包括装置性能数据库系统，所述装置性能数据库系统将所选择的装置性能附加到从所述客户机装置的装置浏览器接收的输入互联网地址URL，并将所述请求重定向到所述独一装置概要管理系统； 其中所述独一装置概要管理系统检索所述客户机装置的概要，检索存在于所述概要数据库中的所有装置概要，并依次排除不匹配的概要，直到单个概要被留下或者所有概要都已被使用为止；如果多于一个概要被留下，则使用Tanimoto相似性关联将当前请求装置概要与每个剩余装置概要进行比较，如果当被与所述当前请求概要进行比较时与子集“property=value”三元组的分级列表全部匹配的单个剩余装置概要低于预定的Tanimoto相似性系数阈值，则将该概要识别为在所述概要数据库中根据来自同一装置的以前的请求更新的当前请求装置概要；以及 Said unique device identification management system comprises a device capabilities database system, the database system performance of the device performance of the device attached to the input of the selected Internet address URL received from the device browser of the client device, and said requests directed to the unique device profile management system; wherein the unique device profile outline management system retrieves the client device, retrieves all present in the device profile database in the summary, and sequentially eliminates profiles not matching, until a single profile is left or all profiles have been used so far; if more than one profile is left, using the Tanimoto similarity relationships schematic of the apparatus is compared with the current request of each remaining outline means if and when the said subset "property = value" single remaining device profile hierarchical list of matching all triples below a predetermined Tanimoto similarity coefficient threshold when compared outline current request, then the outline is identified based on the summary database previous request from the same device current request updated summary means; and 向发起装置发送响应，其中与所述概要数据库中的所述装置相关联的所述全球唯一标`识符被嵌入在所述响应中，并被返回给发起所述独一装置识别请求的所述装置浏览器。 Sending a response to the originating device, wherein the summary and the database means associated with the globally unique identifier `mark is embedded in the response and returned to the originating unique device identification request the said browser means. 6.如权利要求5所述的系统，其中所述装置浏览器为移动装置浏览器。 The system as claimed in claim 5, wherein said apparatus is a mobile device browser to browser. 7.如权利要求5所述的系统，其中所述脚本由所述脚本服务器动态产生。 7. The system of claim 5, wherein the script server dynamically generated by the script. 8.如权利要求5所述的系统，其中所述独一装置概要管理系统为微软的.NET匿名用户概要系统。 The system as claimed in claim 5, wherein the unique device profile management system is a Microsoft .NET anonymous user profile system. 9.一种用于实现在联网客户机-服务器环境下唯一地识别网络分布式装置的匿名的且对用户透明的技术的系统，所述系统包括: 内容服务器，所述内容服务器通过全球通讯网络连接至客户机装置，并且所述内容服务器包括第一软件模块和内容服务器处理器，所述第一软件模块引导所述内容服务器处理器将内容页面从所述内容服务器发送到所述客户机装置，所述内容页面具有表示页面内容的多个计算机可读指令和用于在所述客户机装置上下载和执行脚本的嵌入代码； 脚本服务器，所述脚本服务器通过所述全球通讯网络连接至所述客户机装置，并且所述脚本服务器包括第二软件模块和脚本服务器处理器，所述第二软件模块引导所述脚本服务器处理器将所述脚本发送到所述客户机装置，所述脚本被配置用于将独一装置识别请求透明地插入所述内容页面； 独 9. A method for implementing in a networked client - server environment uniquely identifying network-distributed devices anonymous and transparent to the user of the technology, the system comprising: a content server through a global communication network, the content server connected to the client device and the content server comprises a first processor and a content server software module, the first software module directs the processor to content page server content transmitted from the content server to the client device a plurality of computers, a page having the content page content represented readable instructions and codes for embedding in the client device and the execution of scripts; server script, the script by the server connected to the global communication network said client device, and said second software module comprises a script and server script server processor, the second software module directs the script to the server processor transmits the script to the client device, the script is configured for unique device identification request transparently inserted into the content page; alone 一装置识别管理系统，所述独一装置识别管理系统通过所述全球通讯网络与所述客户机装置进行通信，并且所述独一装置识别管理系统包括第三软件模块和第三处理器，所述第三软件模块引导所述第三处理器来: 从所述客户机装置接收独一装置识别数据，其中所述独一装置识别数据不包括浏览器端“小甜饼”， 选择与所述客户机装置相关联的全球唯一标识符，以及将所述全球唯一标识符保存在所述独一装置识别管理系统的数据库中；以及独一装置概要管理系统，所述独一装置概要管理系统与所述独一装置识别管理系统进行通信，并且所述独一装置概要管理系统包括第四软件模块和第四处理器，所述第四软件模块引导所述第四处理器检索存在于所述独一装置概要管理系统的概要数据库中的装置概要，用于与所述客户机装置的概要进行比较， 其中所述 A device identification management system, a unique device identification management system via said global communication network and said client device communicates, and the unique device identification management system comprises a third processor and a third software module, the said third software module to guide the third processor to: receive from the client device a unique device identification data, wherein the unique device identification data does not include a browser "cookie", to select the globally unique identifier associated with the client device, the globally unique identifier and stored in a database of the unique device identification management system; and the unique device profile management system, a unique device profile management system the unique device identification management system in communication, and the unique device profile management system includes a fourth processor and a fourth software module, the software module directs the fourth fourth processor retrieves only present in the SUMMARY device profile management database means a system for comparing with the profile of the client device, wherein the 独一装置识别管理系统包括装置性能数据库系统，所述装置性能数据库系统将所选择的装置性能附加到从所述客户机装置的装置浏览器接收的输入互联网地址URL，并将所述请求重定向到所述独一装置概要管理系统； 其中所述独一装置概要管理系统检索所述客户机装置的概要，检索存在于所述概要数据库中的所有装置概要，并依次排除不匹配的概要，直到单个概要被留下或者所有概要都已被使用为止；以及如果当被与当前请求概要进行比较时没有剩余装置概要低于预定的Tanimoto相似性系数阈值，将所述当前概要识别为来自所述独一装置的第一次请求，并将所述当前概要作为新的装置概要保存在所述概要数据库中，并且向发起装置发送响应，其中与所述概要数据库中的所述装置相关联的所述全球唯一标识符被嵌入在所述响应中，并被返回给发起所述独 A unique device identification management system comprises a device capabilities database system, the database system performance apparatus additional means to input the selected performance Internet address URL received from the device browser of the client device and redirects the request to the unique device profile management system; wherein said retrieving summary unique device profile management system client device, retrieves all the summary is present in the device profile database, and sequentially eliminates profiles not matching until a single profile is left or all profiles have been used so far; when and if the current request is a schematic compared with when no device profile is lower than a predetermined remaining Tanimoto similarity coefficient threshold value, the current profile is identified from the unique a first requesting means, and the current profile as a new device profile stored in the summary database, and sends a response to the originating device, and wherein the summary of the database associated with the device globally unique identifier is embedded in the response and returned to the originating alone 装置识别请求的所述装置浏览器。 The device recognition request of the browser device. 10.如权利要求9所述的系统，其中所述装置浏览器为移动装置浏览器。 10. The system according to claim 9, wherein said device is a mobile device browser to browser. 11.如权利要求9所述的系统，其中所述脚本由所述脚本服务器动态产生。 11. The system according to claim 9, wherein the script server dynamically generated by the script. 12.如权利要求9所述的系统，其中所述独一装置概要管理系统为微软的.NET匿名用户概要系统。 12. The system according to claim 9, wherein the unique device profile management system is a Microsoft .NET anonymous user profile system. 13.一种用于实现在联网客户机-服务器环境下唯一地识别网络分布式装置的匿名的且对用户透明的技术的系统，所述系统包括: 内容服务器，所述内容服务器通过全球通讯网络连接至客户机装置，并且所述内容服务器包括第一软件模块和内容服务器处理器，所述第一软件模块弓丨导所述内容服务器处理器将内容页面从所述内容服务器发送到所述客户机装置，所述内容页面具有表示页面内容的多个计算机可读指令和用于在所述客户机装置上下载和执行脚本的嵌入代码； 脚本服务器，所述脚本服务器通过所述全球通讯网络连接至所述客户机装置，并且所述脚本服务器包括第二软件模块和脚本服务器处理器，所述第二软件模块引导所述脚本服务器处理器将所述脚本发送到所述客户机装置，所述脚本被配置用于将独一装置识别请求透明地插入所述内容页面； 13. A method for implementing in a networked client - server environment uniquely identifying network-distributed devices anonymous and transparent to the user of the technology, the system comprising: a content server through a global communication network, the content server connected to the client device and the content server comprises a first processor and a content server software module, the first software module guide arch Shu the content page content server processor to transmit content from the server to the client machine means having a plurality of the content page code is embedded computer-readable instructions for downloading on the client device and the execution of the script showing the content of the page; server script, the script server via said global communication network to the client device, and said second software module comprises a script and server script server processor, the second software module directs the script to the server processor transmits the script to the client device, said script is configured for unique device identification request transparently inserted into the content page; 独一装置识别管理系统，所述独一装置识别管理系统通过所述全球通讯网络与所述客户机装置进行通信，并且所述独一装置识别管理系统包括第三软件模块和第三处理器，所述第三软件模块引导所述第三处理器来:从所述客户机装置接收独一装置识别数据，其中所述独一装置识别数据不包括浏览器端“小甜饼”， 选择与所述客户机装置相关联的全球唯一标识符，以及将所述全球唯一标识符保存在所述独一装置识别管理系统的数据库中；以及独一装置概要管理系统，所述独一装置概要管理系统与所述独一装置识别管理系统进行通信，并且所述独一装置概要管理系统包括第四软件模块和第四处理器，所述第四软件模块引导所述第四处理器检索存在于所述独一装置概要管理系统的概要数据库中的装置概要，用于与所述客户机装置的概要进行比较， 其中所 A unique device identification management system, a unique device identification management system via said global communication network and said client device communicates, and the unique device identification management system comprises a third processor and a third software module, the third software module to guide the third processor to: receive a unique device identification data from the client device, wherein the unique device identification data does not include a browser "cookies", and select the said globally unique identifier associated with the client device, the globally unique identifier and stored in a database of the unique device identification management system; and the unique device profile management system, a unique device profile management system with the unique device identification management system in communication, and the unique device profile management system includes a fourth processor and a fourth software module, the software module fourth processor retrieves the fourth guide in the present SUMMARY database device unique device profile management system is for comparison with the profile of the client device, wherein 述独一装置识别管理系统包括装置性能数据库系统，所述装置性能数据库系统将所选择的装置性能附加到从所述客户机装置的装置浏览器接收的输入互联网地址URL，并将所述请求重定向到所述独一装置概要管理系统； 其中所述独一装置概要管理系统检索所述客户机装置的概要，检索存在于所述概要数据库中的所有装置概要，并依次排除不匹配的概要，直到单个概要被留下或者全部概要都已被使用为止，检索存在于所述概要数据库中的与当前请求概要匹配的所有装置概要，并依次排除不匹配的概要，直到单个概要被留下或者所有值都已被使用为止，以及如果零个剩余装置概要剩下，则将所述当前概要识别为来自所述独一装置的第一次请求，并将所述当前概要作为新的装置概要保存在所述概要数据库中，并且向发起装置发送响应，其中与所述概要数据 Said unique device identification management system comprises a device capabilities database system, the database system performance of the device performance of the device attached to the input of the selected Internet address URL received from the device browser of the client device, and said requests directed to the unique device profile management system; wherein the unique device profile outline management system retrieves the client device, retrieves all present in the device profile database in the summary, and sequentially eliminates profiles not matching, until a single profile is left or all SUMMARY have been used up, to retrieve all present in the device profile database with the current request matches the outline of the outline, and sequentially eliminates profiles not matching until a single profile is left or all values ​​have been used so far, and if the remaining zero remaining device profile, the current profile is identified as a unique means from the first request, and then the current profile of the saved as a new device profile in the summary database, and sends a response to the originating device, and wherein the summary data 库中的所述装置相关联的所述全球唯一标识符被嵌入在所述响应中，并被返回给发起所述独一装置识别请求的所述装置浏览器。 The library globally unique identifier associated with the device is embedded in the response and returned to the originating unique device identification request to the device browser. 14.如权利要求13所述的系统，其中所述装置浏览器为移动装置浏览器。 14. 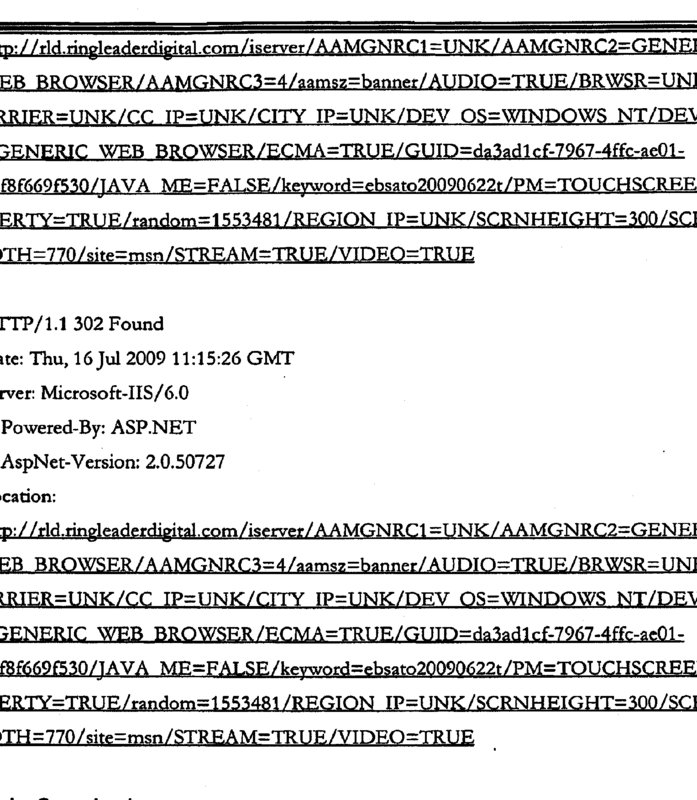 The system according to claim 13, wherein said apparatus is a mobile device browser to browser. 15.如权利要求13所述的系统，其中所述脚本由所述脚本服务器动态产生。 15. The system according to claim 13, wherein the script server dynamically generated by the script. 16.如权利要求13所述的系统，其中所述独一装置概要管理系统为微软的.NET匿名用户概要系统。 16. The system according to claim 13, wherein the unique device profile management system is a Microsoft .NET anonymous user profile system. 17.一种实现联网客户机-服务器`环境下唯一地识别网络分布式客户机装置的匿名的且对用户透明的技术的方法，其中，所述方法包括: 将内容页面发送到客户机装置，所述内容页面具有表示页面内容的多个计算机可读指令和用于在所述客户机装置上下载和执行脚本的嵌入代码； 将所述脚本从第一服务器发送到所述客户机装置，所述脚本被配置用于将独一装置识别请求透明地插入所述内容页面； 从所述客户机装置接收无“小甜饼”的装置鉴别信息， 其中所述无“小甜饼”的装置鉴别信息不包括浏览器端“小甜饼”; 基于所述无“小甜饼”的装置鉴别信息确定所述客户机装置的识别匹配概要是否已存在，其中确定步骤包括: 检索存在于概要数据库中的多个装置概要，以及依次排除不匹配所述无“小甜饼”的装置鉴别信息的所述装置概要，直到单个装置 17. A networked client - anonymous and user-transparent method to uniquely identify the network technology of distributed client device at the server 'environments, wherein said method comprises: a content page to the client device, the content page having a plurality of computer-readable instructions indicate that the page content and codes for embedding in the client device and the execution of the script; the script sent from the first server to the client device, the discriminating means receiving from the client device without "cookie" authentication information apparatus, wherein said free "cookies"; the script is configured for said unique device identification request transparently inserted into the content page information does not include the browser "cookie"; determining the matching identifying the client device based on the outline whether there has been no "cookies" means the authentication information, wherein the determining step comprises: retrieving a database present in the Summary Summary of the plurality of devices, and sequentially eliminates profiles not match the non Summary "cookies" means the authentication information means until a single device 要被留下或者所有所述多个装置概要都已被排除为止；并且执行: 如果单个概要被留下，则将该概要识别为当前请求客户机装置，并在所述概要数据库中根据来自同一客户机装置的以前的请求对所述概要进行更新；或者如果零个剩余装置概要剩下，则将所述当前概要识别为来自所述独一装置的第一次请求，并将所述当前概要作为新的装置概要保存在所述概要数据库中，并且向发起装置发送响应，其中与所述概要数据库中的所述装置相关联的全球唯一标识符被嵌入在所述响应中，并被返回给发起所述独一装置识别请求的所述装置浏览器。 To be left or all of said plurality of devices have been excluded so far schematic; and performing: if a single profile is left, then the outline is identified as the current requesting client device, and from the same in accordance with the summary database previous requests the client device to update the summary; or zero if left remaining device profile, the current profile is identified from the first unique request will be the primary means and said current profile as a new device profile stored in the summary database, and sends a response to the originating device, wherein the globally unique identifier in said database means associated with the summary is embedded in the response and returned to the initiating the unique device identification request to the device browser. 18.如权利要求17所述的方法，其中所述嵌入代码执行对来自第一服务器的所述脚本的请求，并且所述第一服务器为联网脚本服务器。 18. The method according to claim 17, wherein the embedded code of the script execution request from the first server and the first server is a networked script server. 19.如权利要求18所述的方法，其中所述联网脚本服务器动态地产生所述脚本。 19. The method according to claim 18, wherein the networked script server generates said script dynamically. 20.如权利要求17所述的方法，其中所述脚本在所述客户机装置的装置浏览器中执行，并动态地将独一装置识别请求标签插入到所述内容页面中。 20. The method according to claim 17, wherein the script execution in the device of the client browser device, and dynamically request unique device identification tag inserted into the contents of the page. 21.如权利要求20所述的方法，其中所述动态插入的独一装置识别请求标签执行对第二服务器的独一装置识别系统请求。 21. The method according to claim 20, wherein the dynamically inserted unique device identification request tags performing the unique device identification request to the second server system. 22.如权利要求21所述的方法，其中所述第二服务器为独一装置识别管理系统。 22. The method according to claim 21, wherein the second server is a unique device identification management system. 23.如权利要求22所述的方法，其中所述独一装置识别管理系统包括装置性能数据库系统，所述装置性能数据库系统将所选择的装置性能附加到从所述客户机装置的所述装置浏览器接收的输入互联网地址URL，并将所述请求重定向到独一装置概要管理系统。 23. The method according to claim 22, wherein the unique device identification management system comprises a device capabilities database system, the database system means additional performance properties of the selected apparatus to the device from the client device Internet browser receives an input address URL, and redirects the request to the unique device Profile management system. 24.如权利要求23所述的方法，其中所述独一装置概要管理系统为微软的.NET匿名用户概要系统。 24. The method according to claim 23, wherein the unique device profile management system is a system schematic Microsoft's .NET anonymous user. 25.如权利要求17所述的方法，进一步包括将所述全球唯一标识符传达给所述客户机装置的步骤。 25. The method according to claim 17, further comprising the step of communicating the globally unique identifier to the client device. Free format text: FORMER OWNER: LINLIDE NUMBERS CO., LTD.